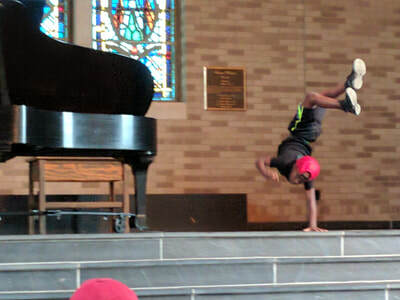 What do you do when rehearsals are canceled due to inclement weather? 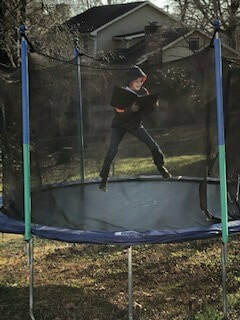 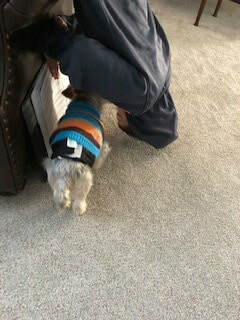 Practice at home, of course! 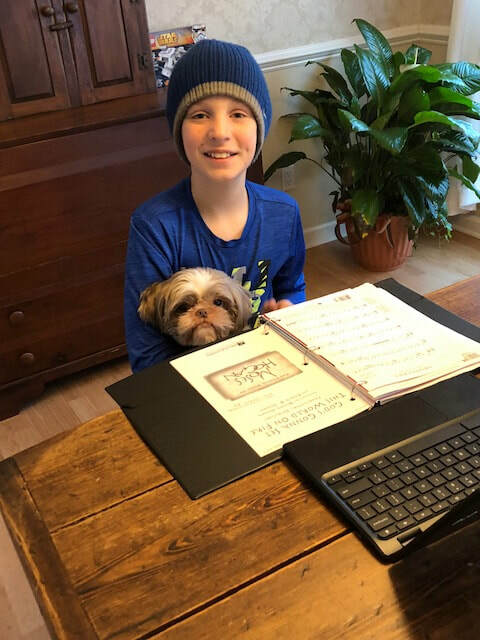 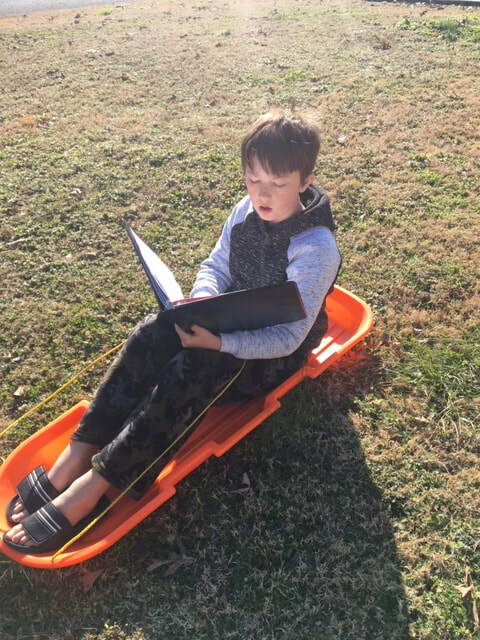 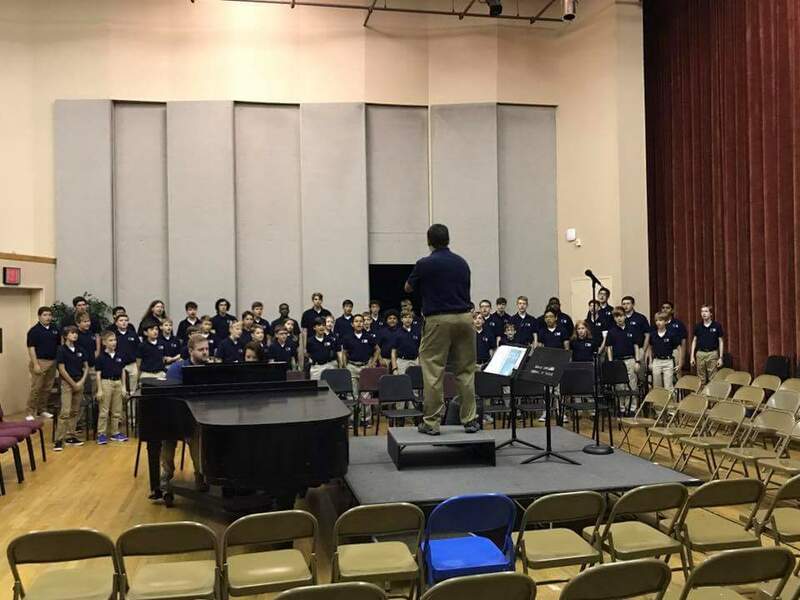 Mr. Oakes issued a " Snow Day Challenge," asking members of the Handel, Concert, and Cantabile choirs to send in a picture of themselves rehearsing their music. What a creative bunch! 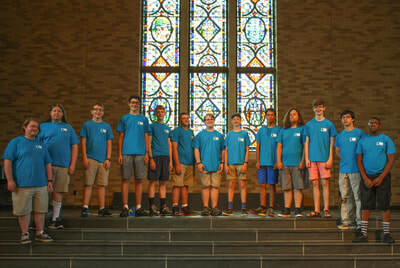 Music and Dr. Martin Luther King Jr.
​Over the course of sixteen seasons with the Chattanooga Boys Choir, I have had many “favorites” – performances that have been artistically stunning, travels that have been eye-opening, and several opportunities to watch boys grow into musically mature and intellectually curious young men. My life has been enriched many times over by the boys’ generous sharing of themselves in rehearsal and performance, as they create a wonderful artistic product that is truly greater than the sum of their parts. 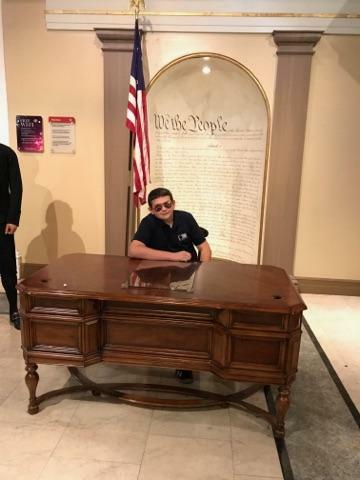 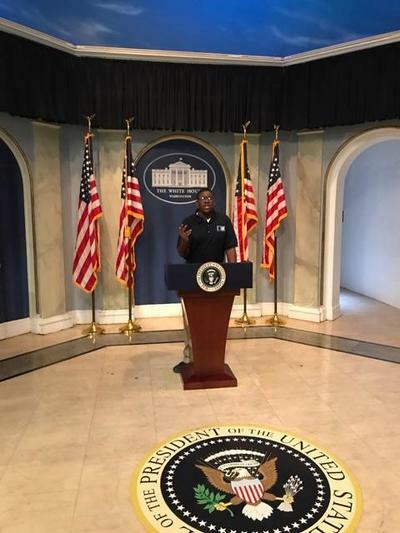 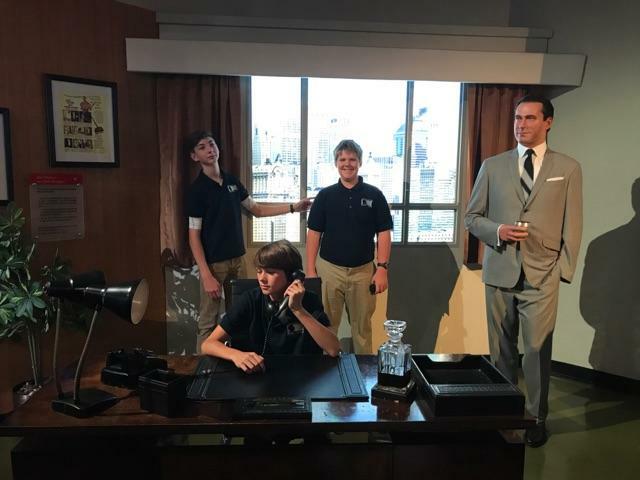 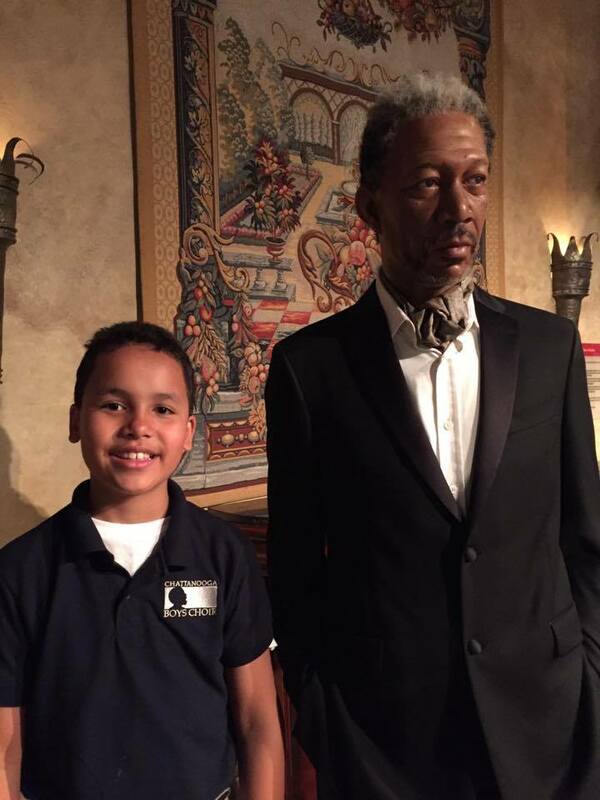 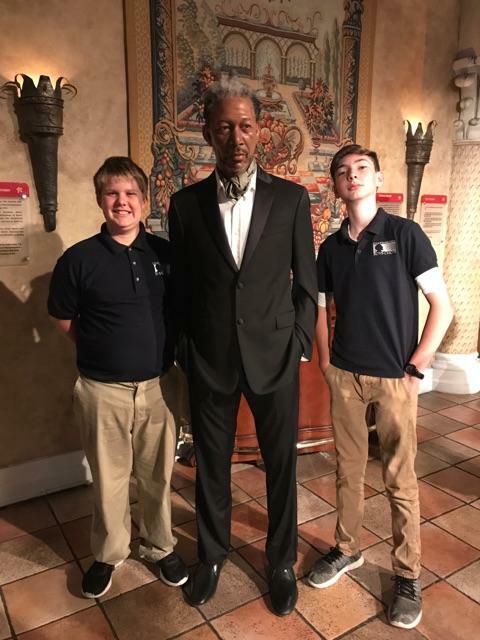 One relatively recent “favorite” occurred during the choir’s summer tour of 2016, when we presented a Civil Rights-themed program in the Civil Rights museums of Memphis TN, Birmingham AL, Montgomery AL, and Atlanta GA. 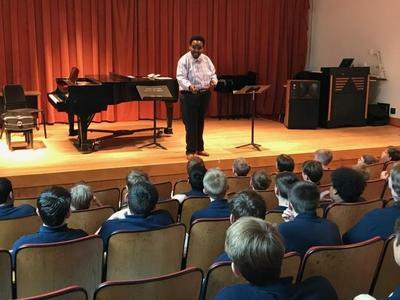 While preparing the repertoire for our travels, I shared several stories about those who faced opposition and overcame adversity during the Civil Rights Movement, leading our nation toward the prized goal of equality. The conversations this sparked with the boys were incredible – they shared their admiration of these great leaders of the past, recognized those who were at work today with such efforts, and commented on how they themselves might be agents of change not only as leaders of tomorrow but as active youth today in their families, schools, and communities. 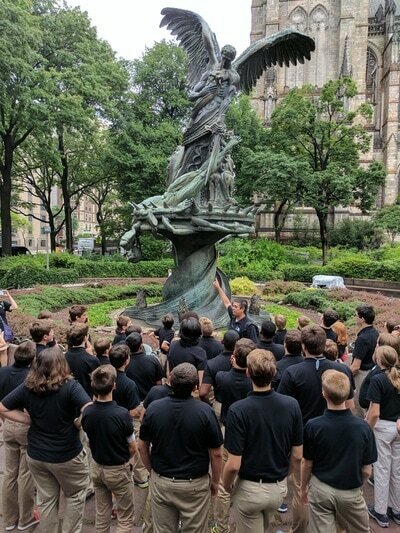 So remarkable is this quote, it is etched into the memorial fountain at the Southern Poverty Law Center in Montgomery AL and in the entryway of the National Museum of African American History and Culture in Washington DC. 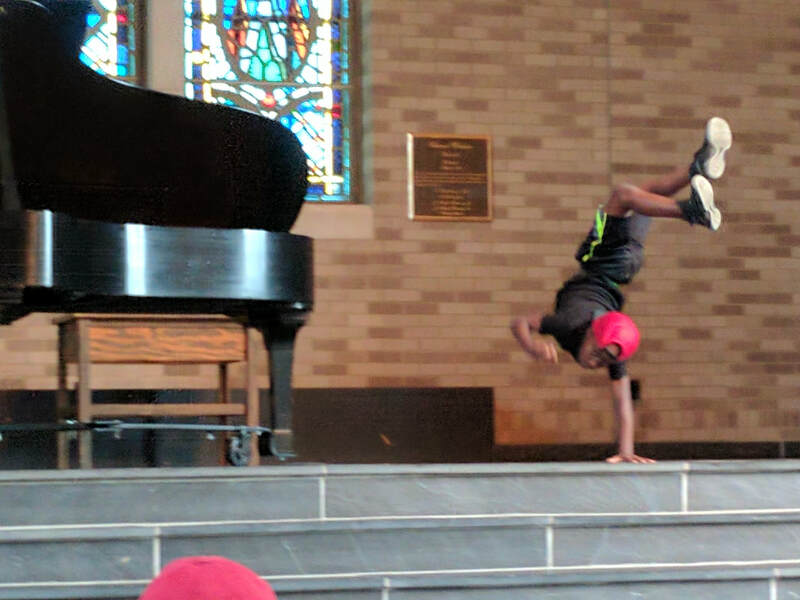 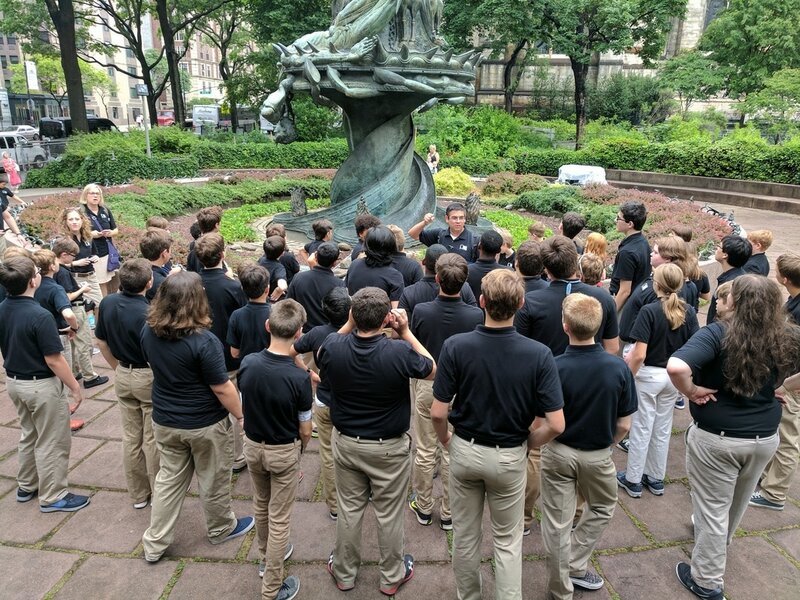 Hearing a song of such gravity performed by these talented young people provides both hope and caution, as we balance the tensions of optimistic youth with present realities, casting both light and a pall on the shared hope that we are leaving our children with a world better than the one we inherited. 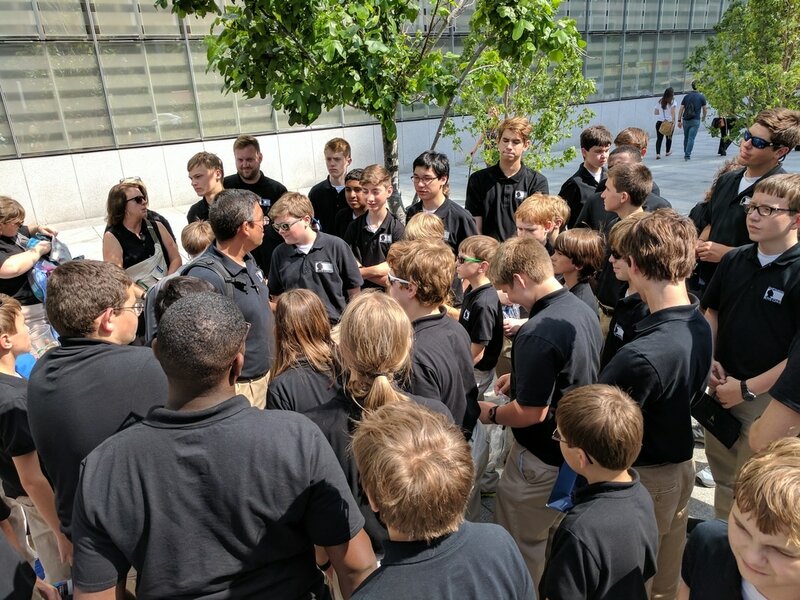 As the choir performed the piece in the bustling lobby of the National Center for Civil and Human Rights in Atlanta, I was struck by this text after touring this remarkable museum, especially given Dr. King’s storied career in Atlanta. 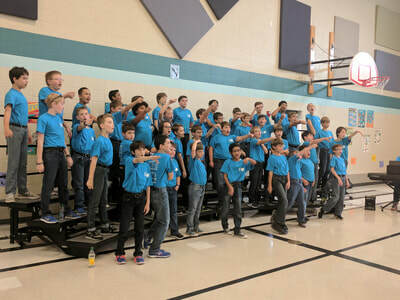 While the boys were singing “Like a Mighty Stream,” I noticed some high school-aged students gesturing and pointing in the direction of the choir. 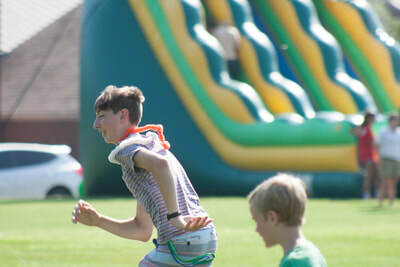 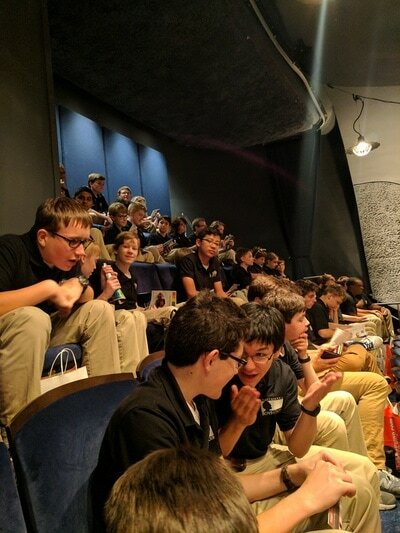 A bit unnerved, I tried to ignore them and identify which of the boys had captured their attention, assuming it was not for a good reason (the boys will tell you of the importance I place on remaining focused on the performance/task at hand!). 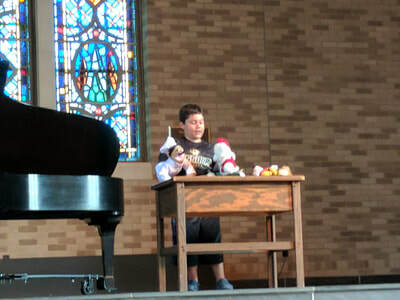 As I glanced inquisitively at the left edge of the choir, I was able to identify the subject of the audience members’ attention. 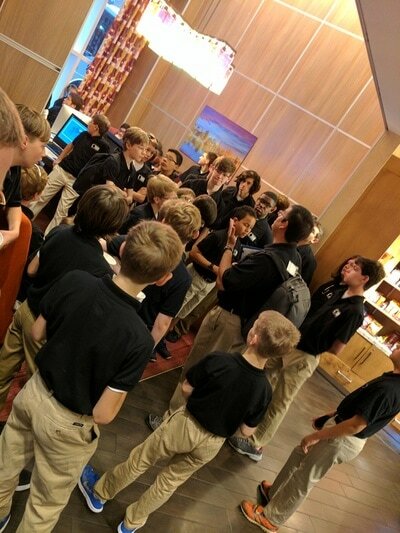 Over the shoulders of those boys, etched into the wall just behind where they were performing, were the same words from Dr. King that we had been singing for the last several minutes – “Let justice roll, like a mighty stream…” In a rare break in character, in front of a lobby filled with tourists and audience members, I asked the boys to turn around and view the words after they finished the piece. An interesting mixture of glee and gravity came over the choir, as they realized more fully the impact of these words and the meaning that was added when we presented it together in our community of song. 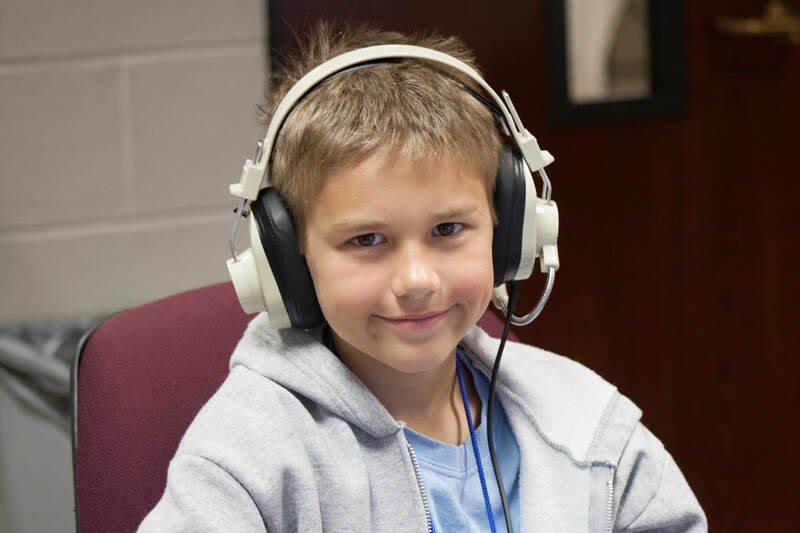 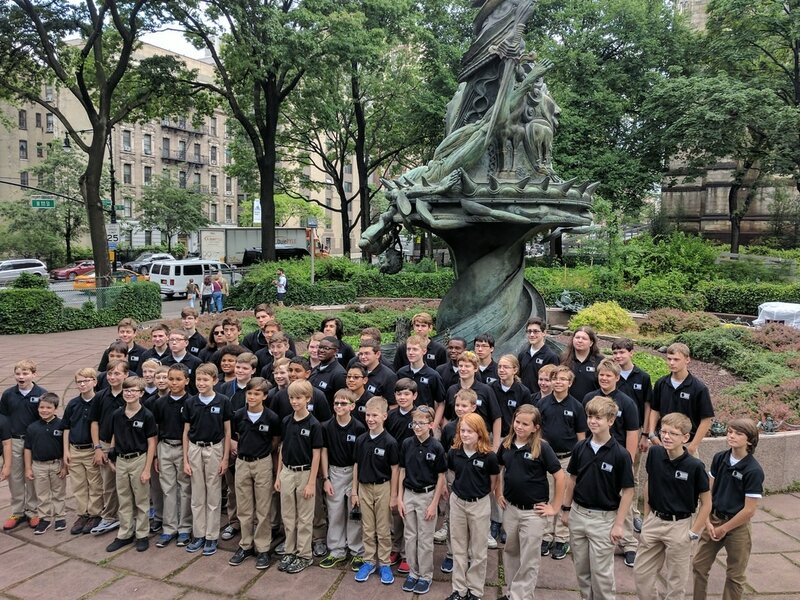 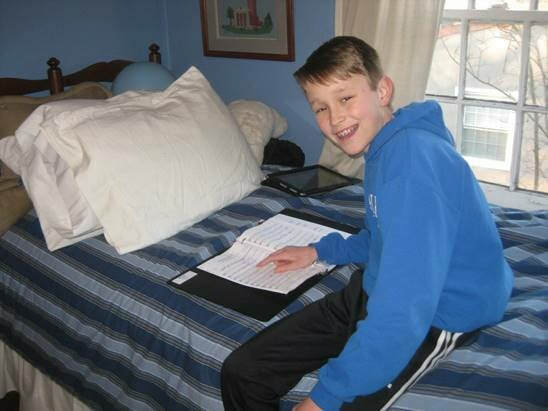 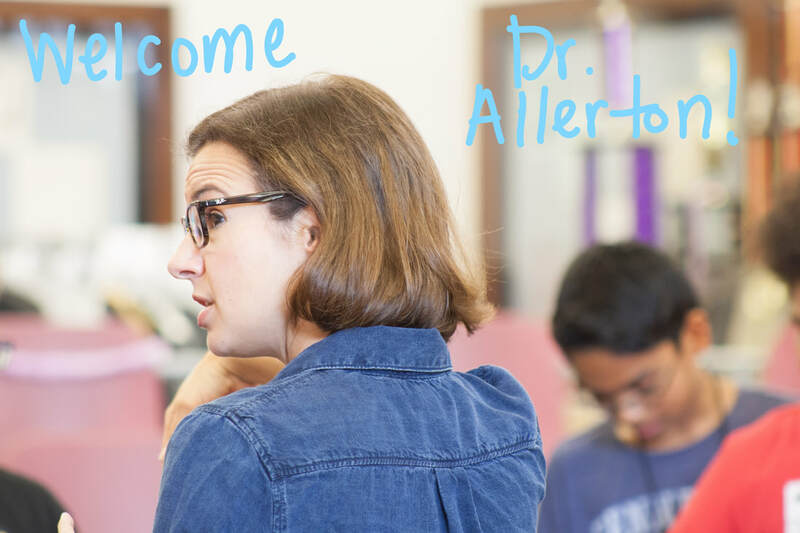 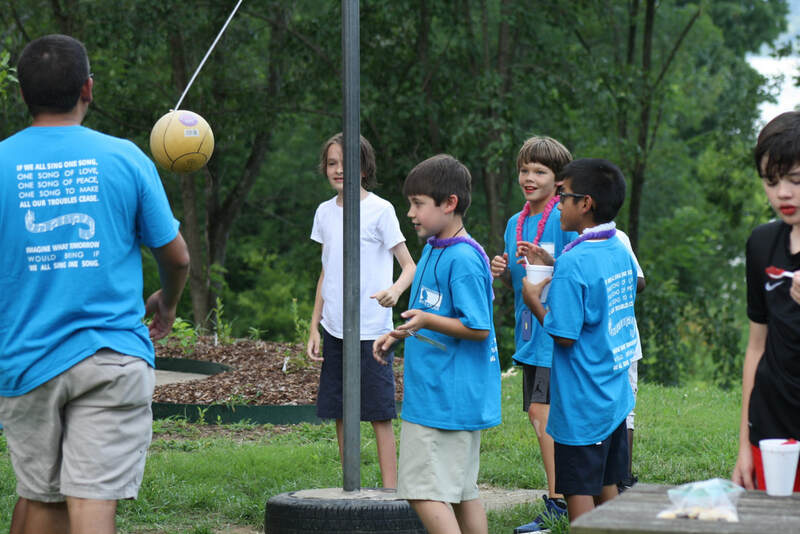 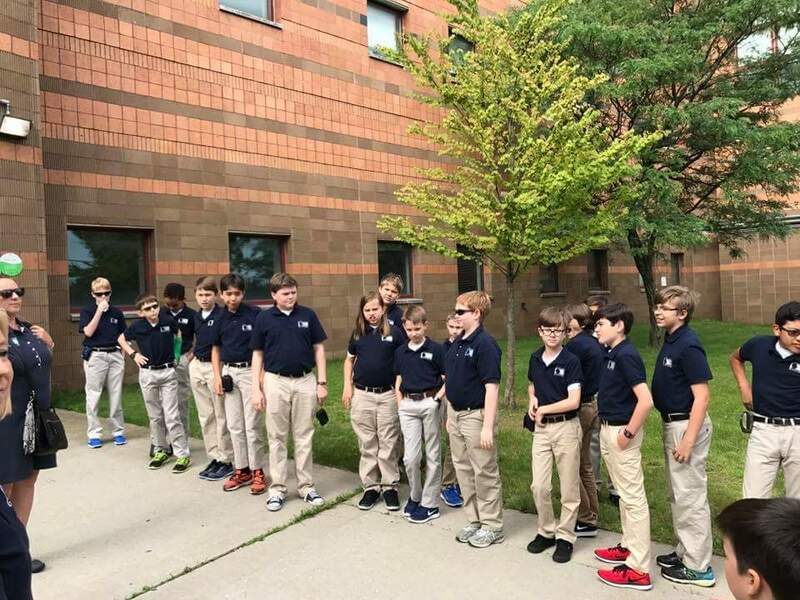 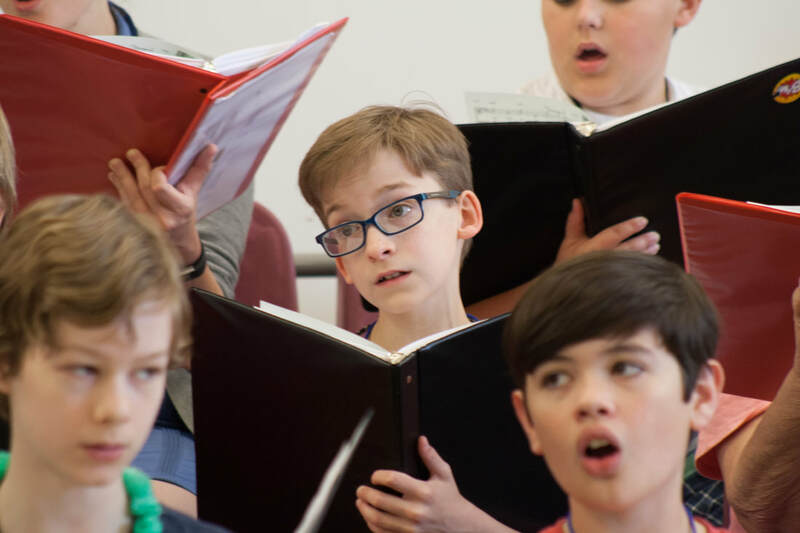 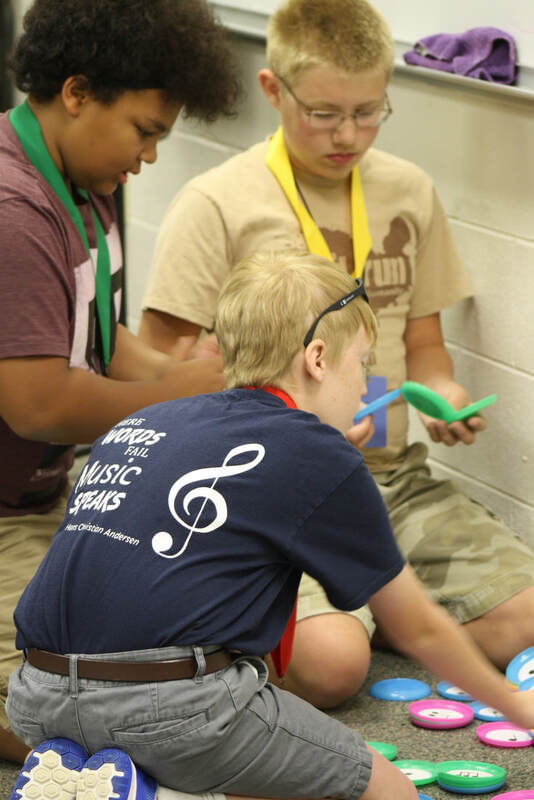 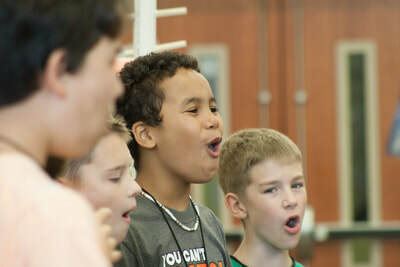 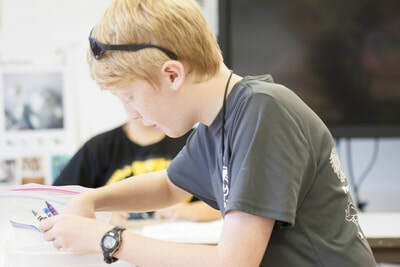 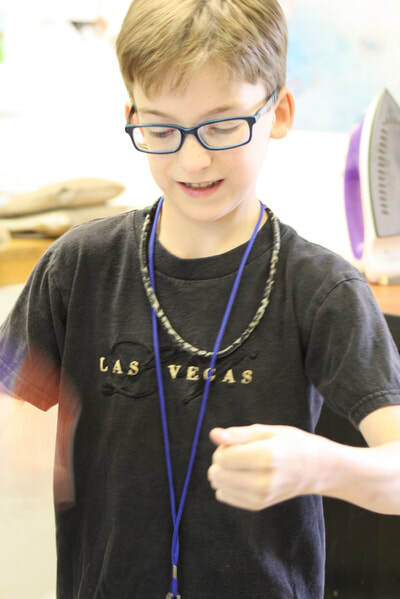 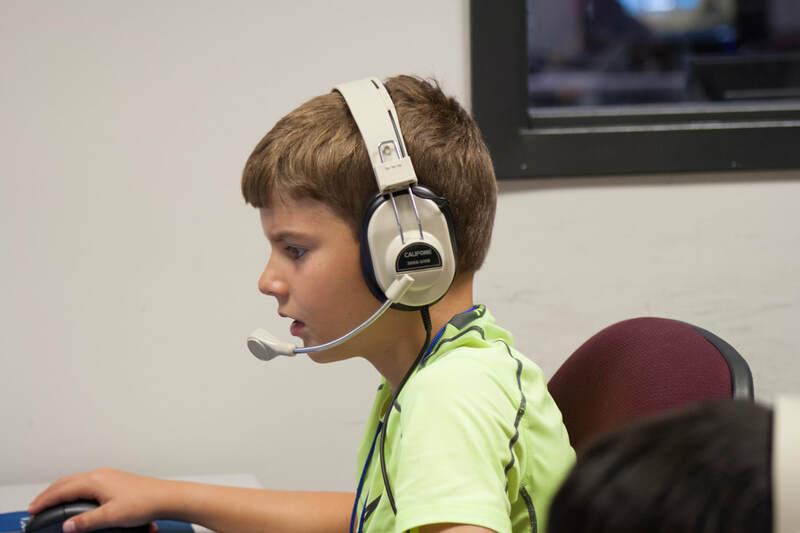 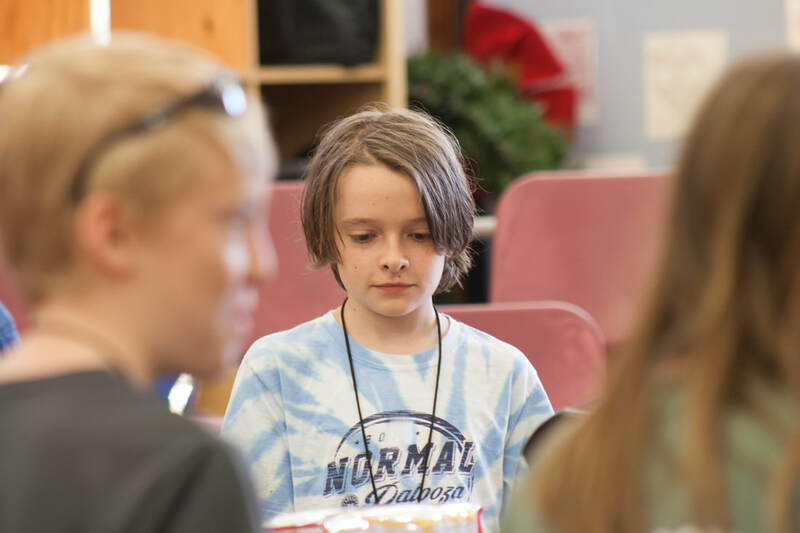 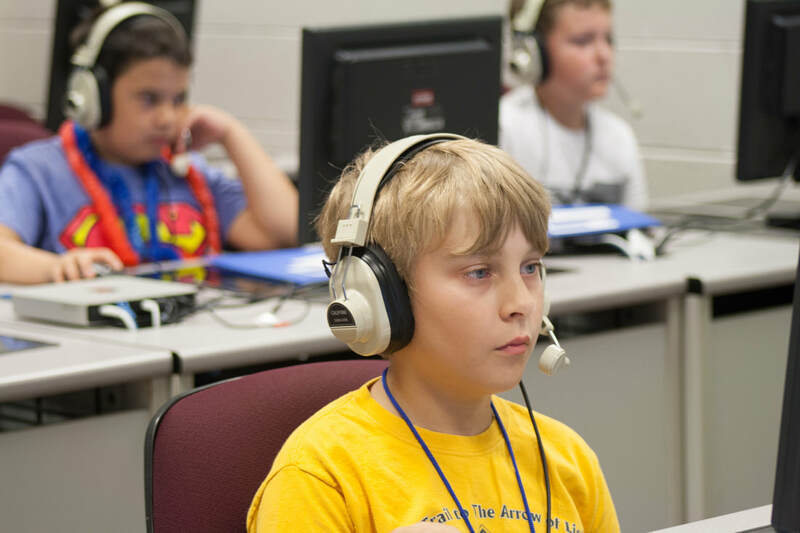 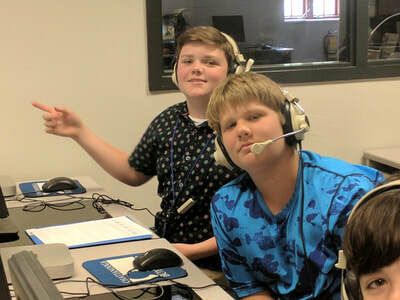 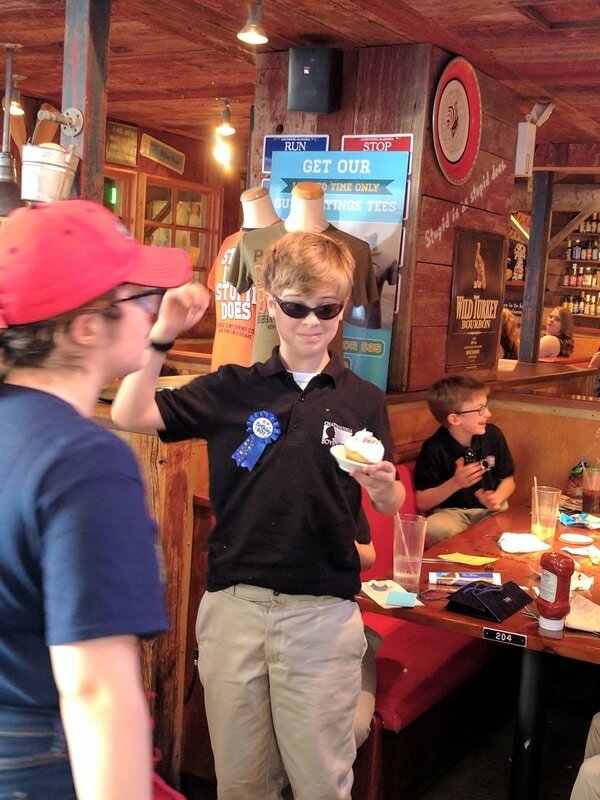 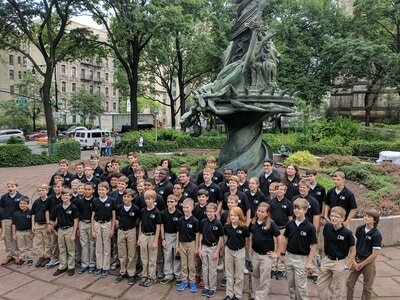 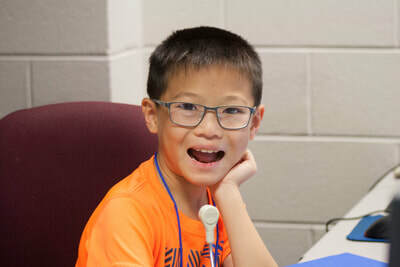 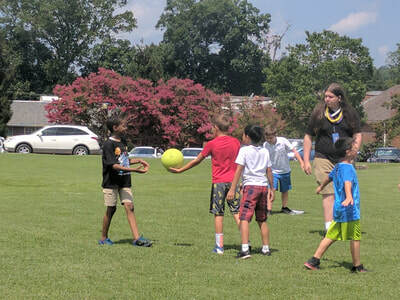 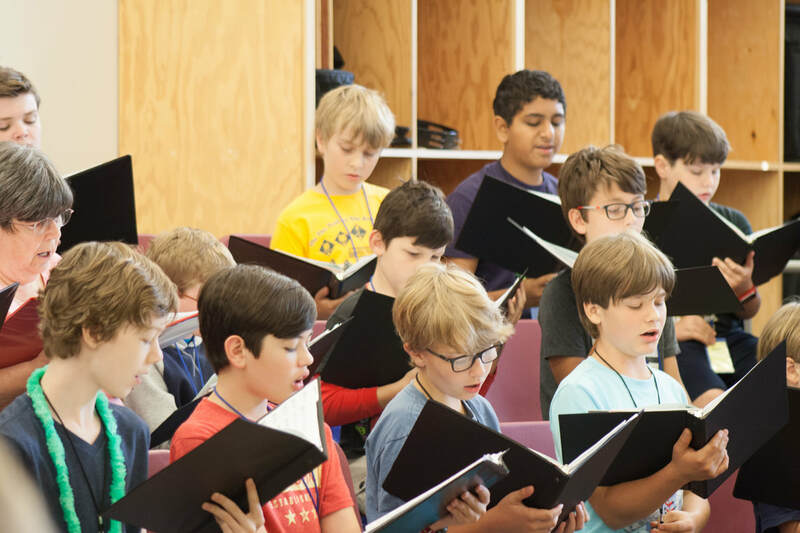 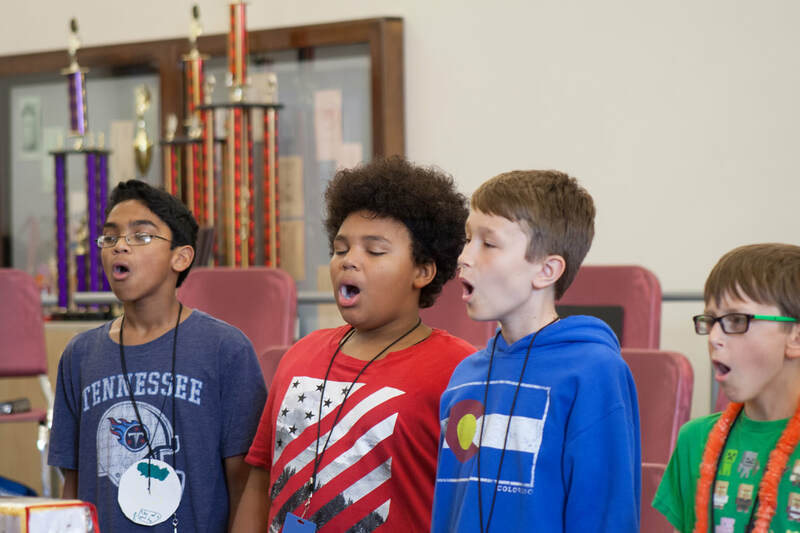 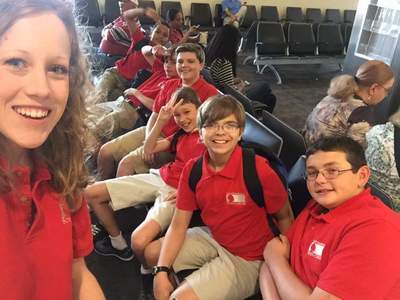 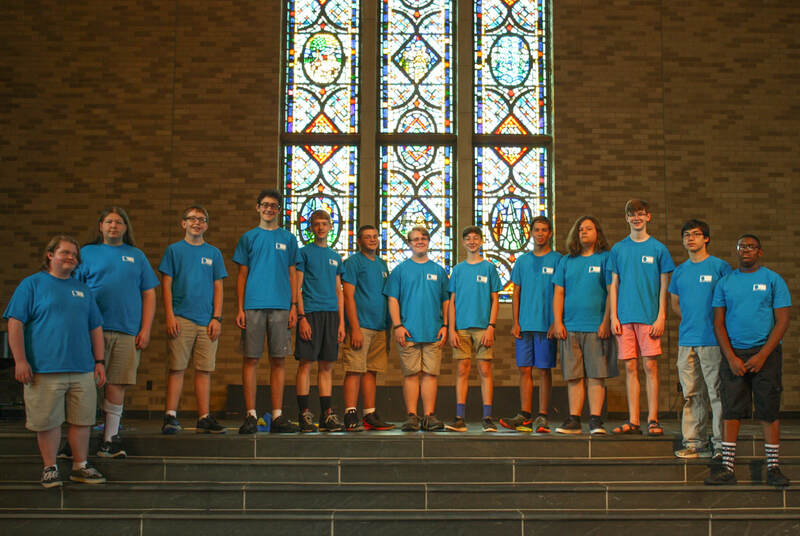 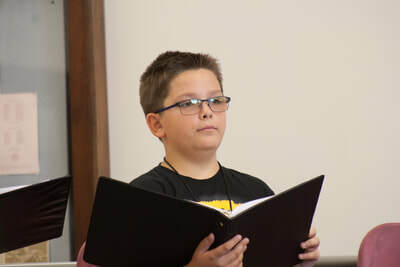 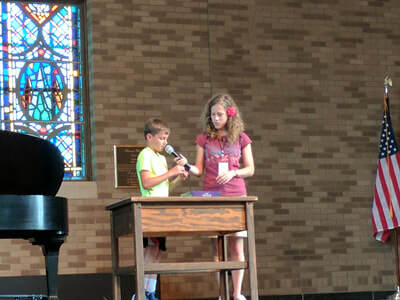 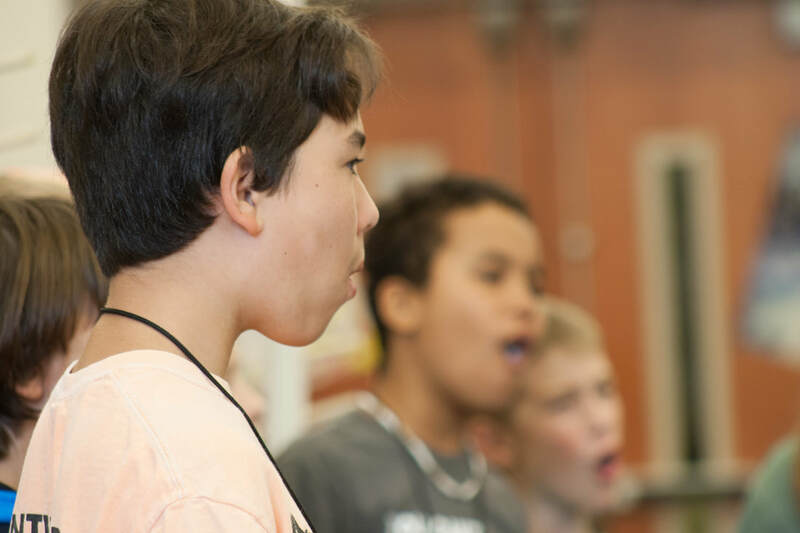 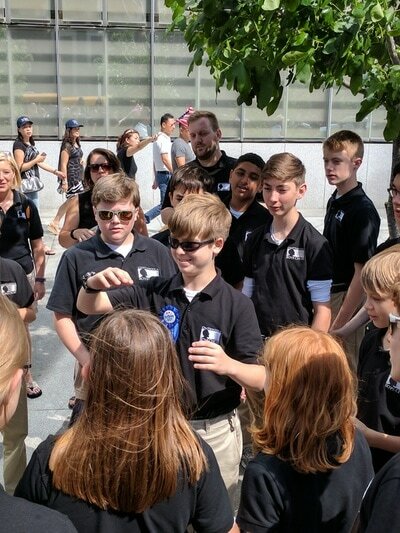 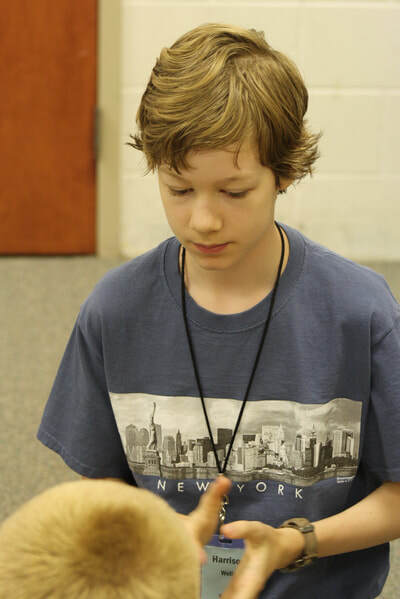 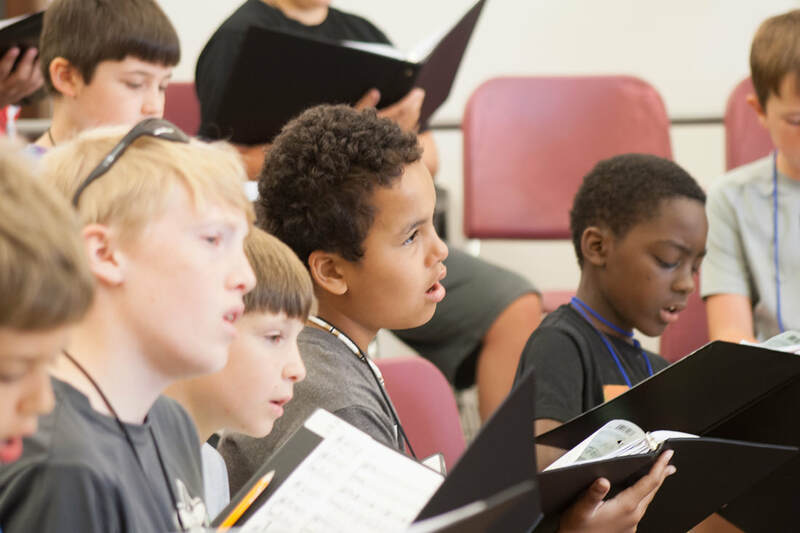 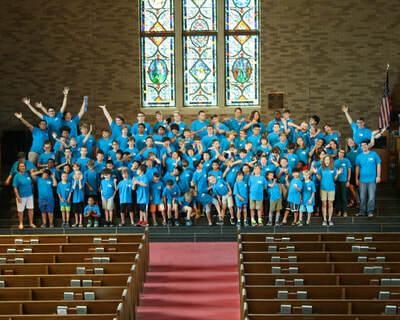 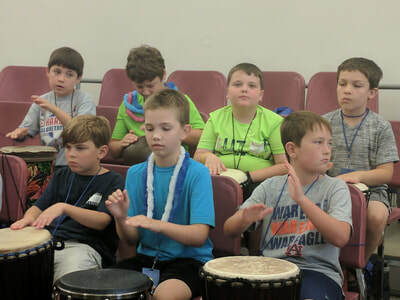 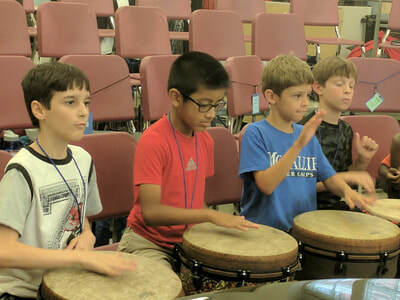 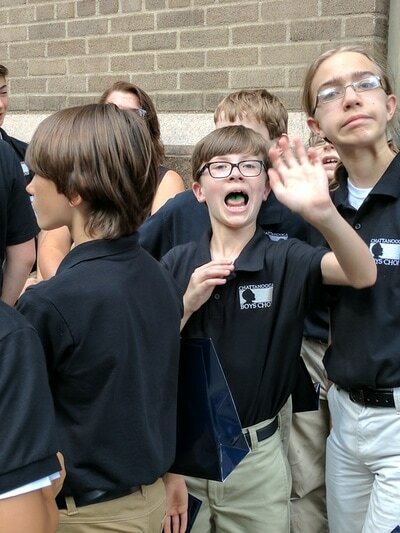 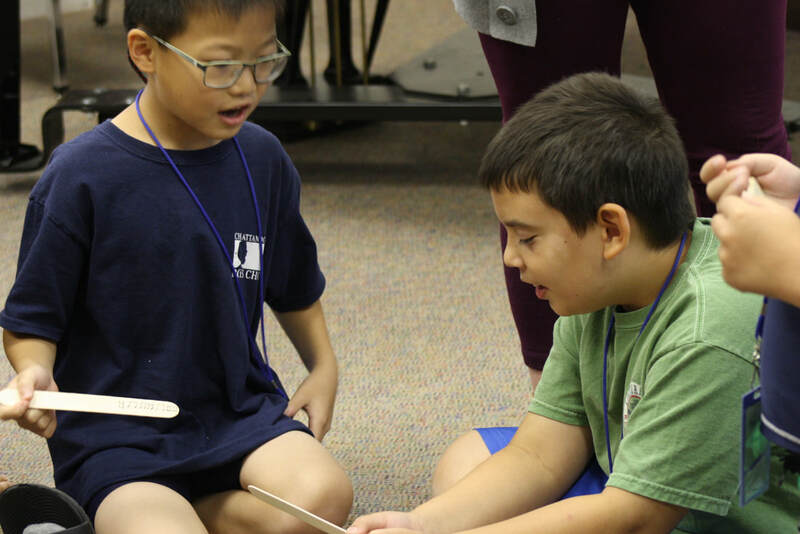 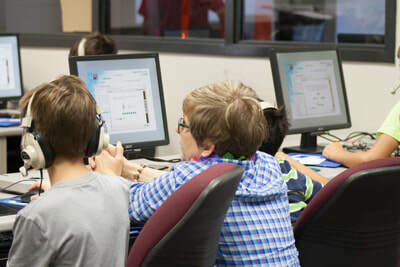 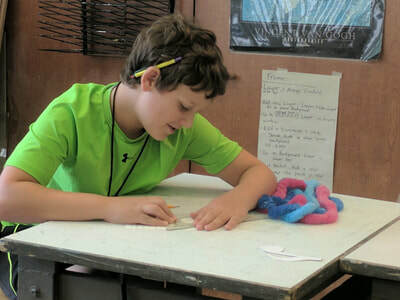 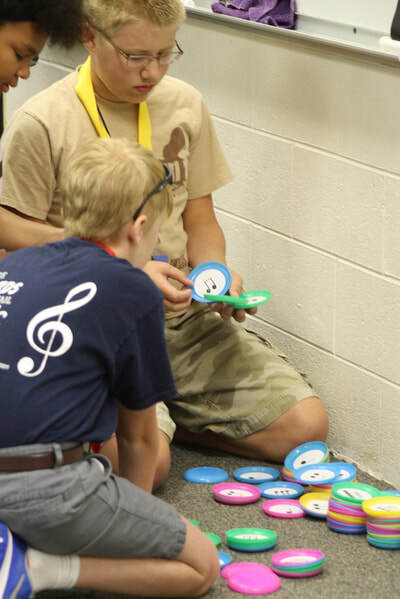 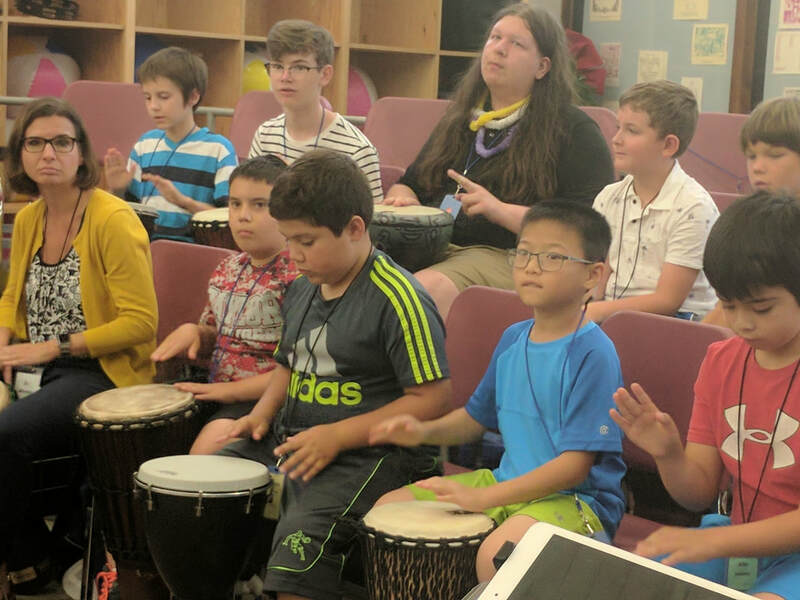 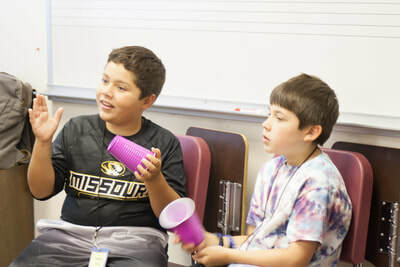 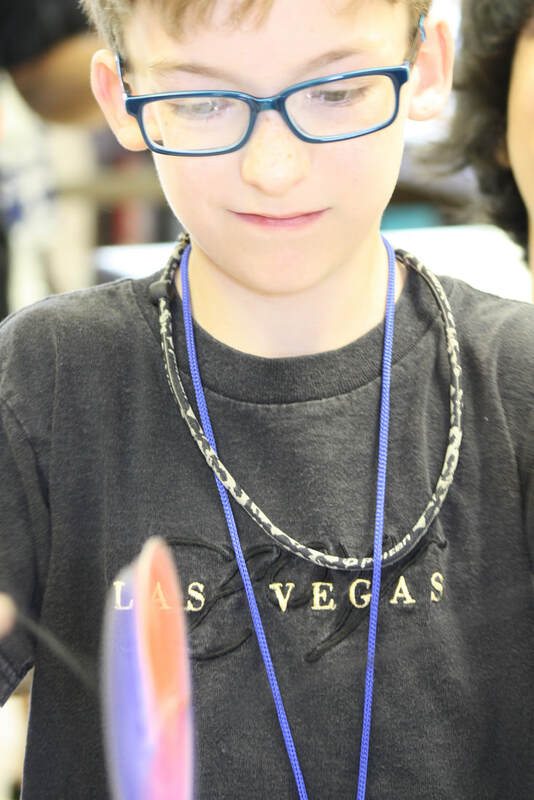 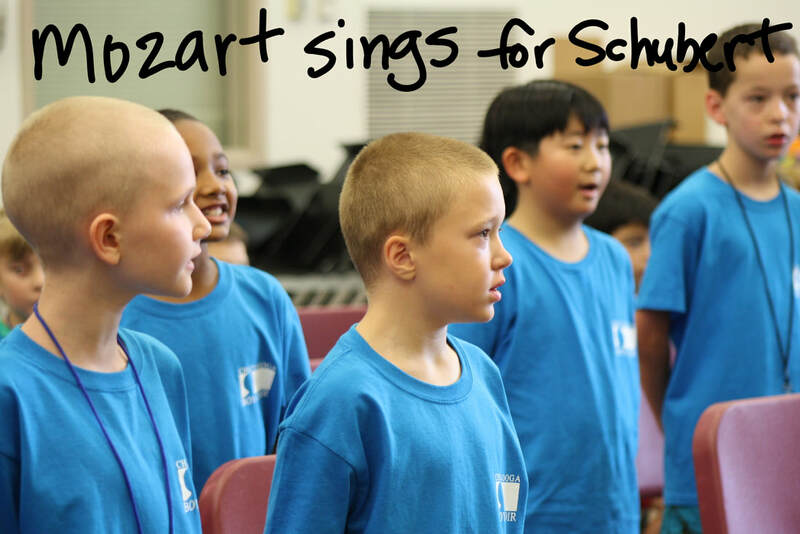 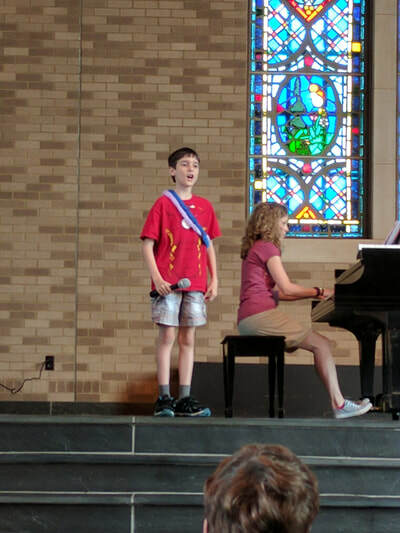 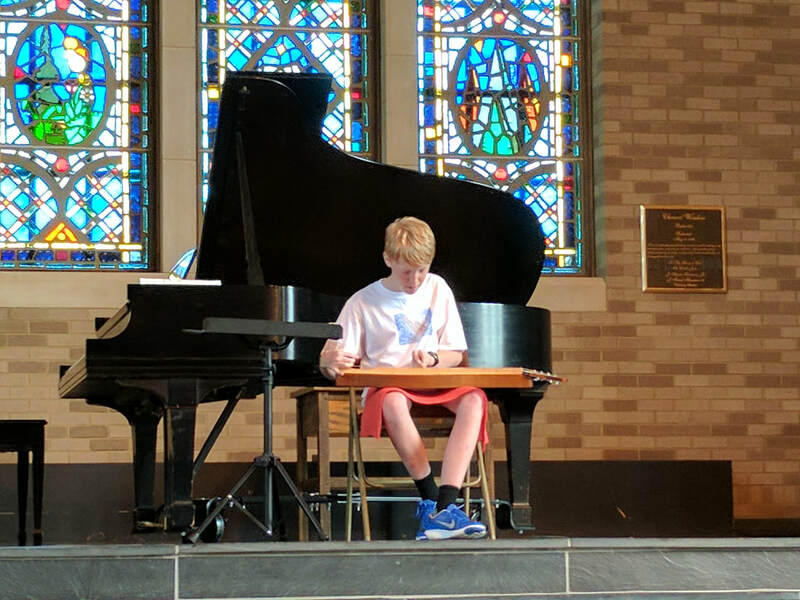 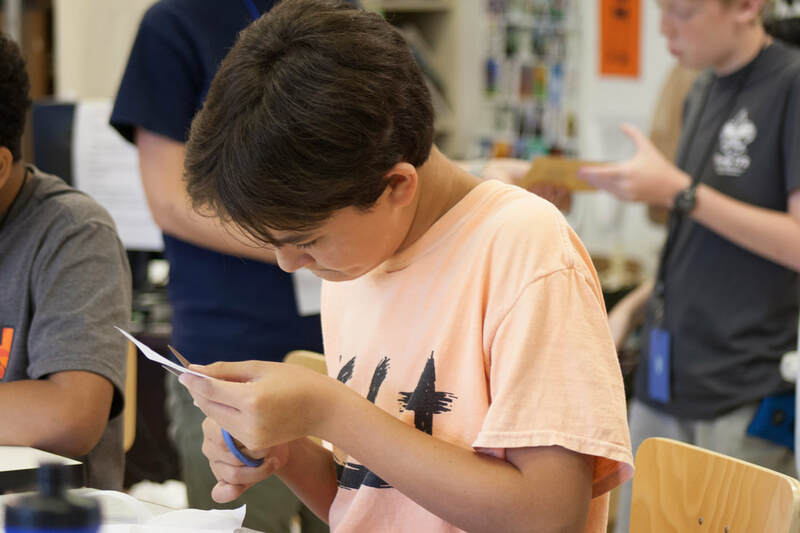 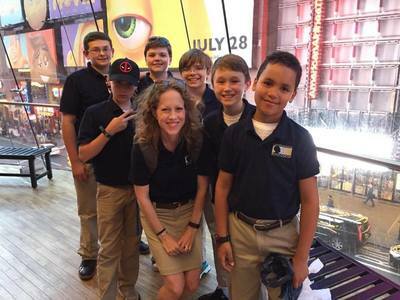 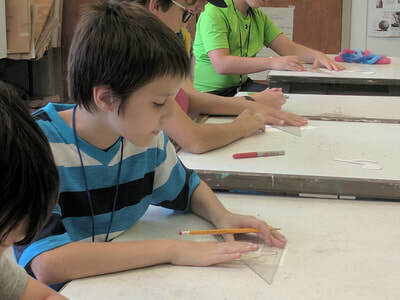 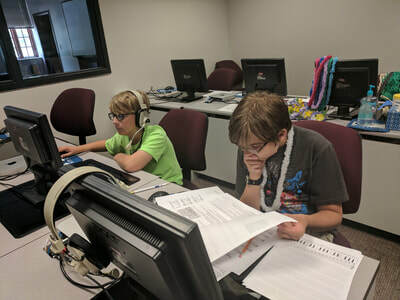 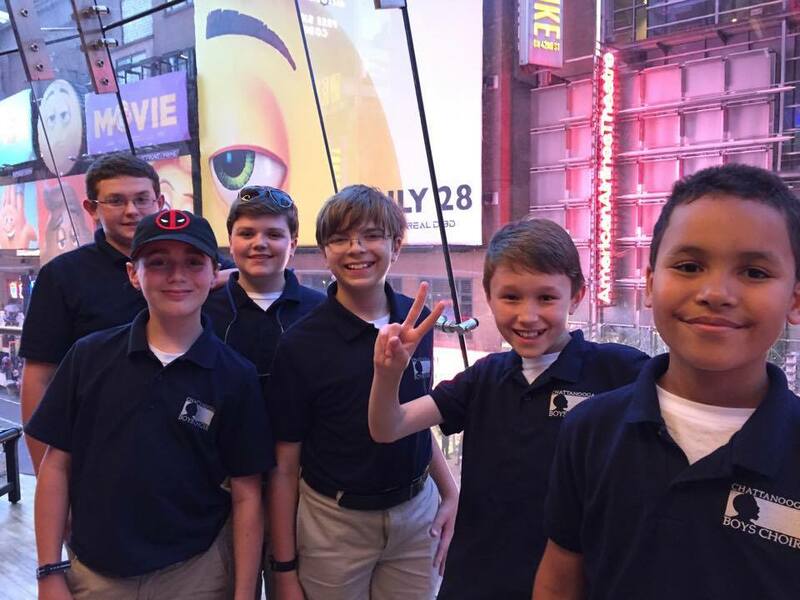 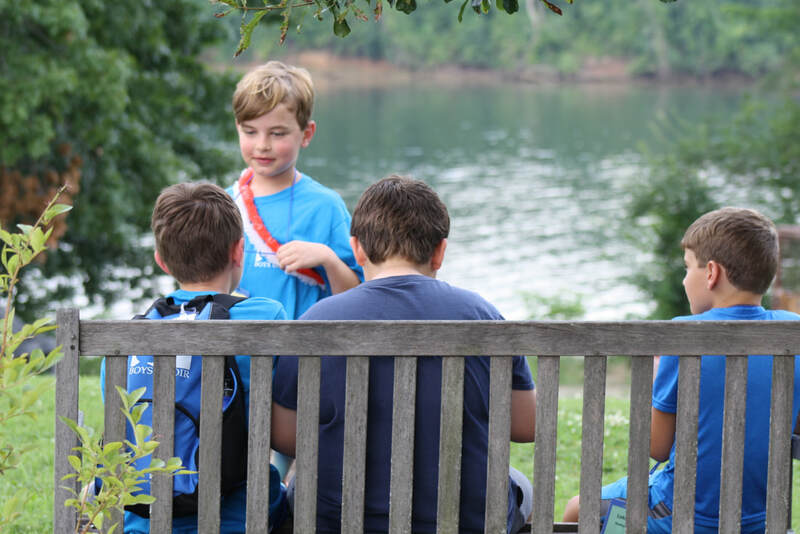 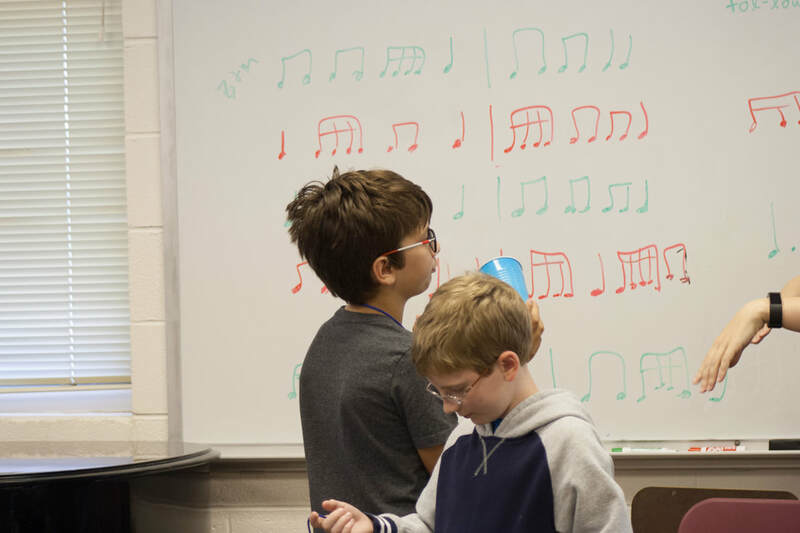 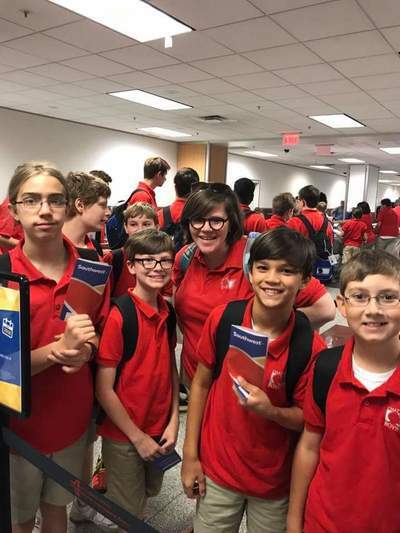 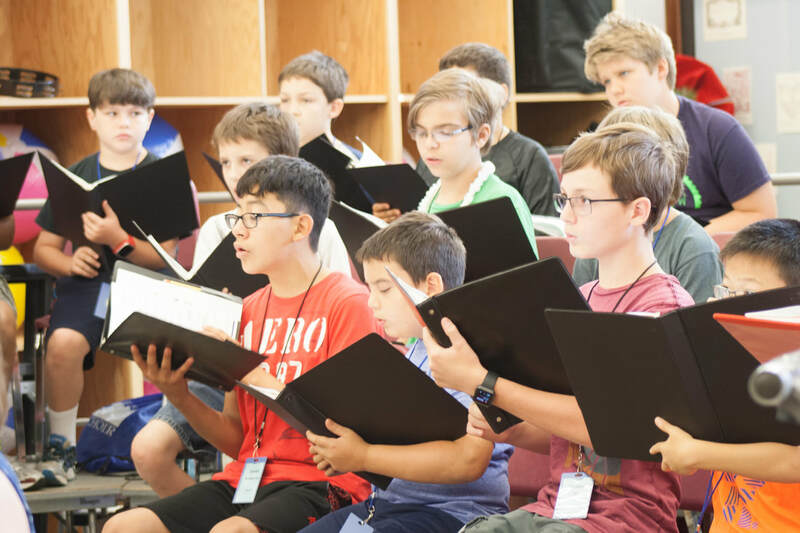 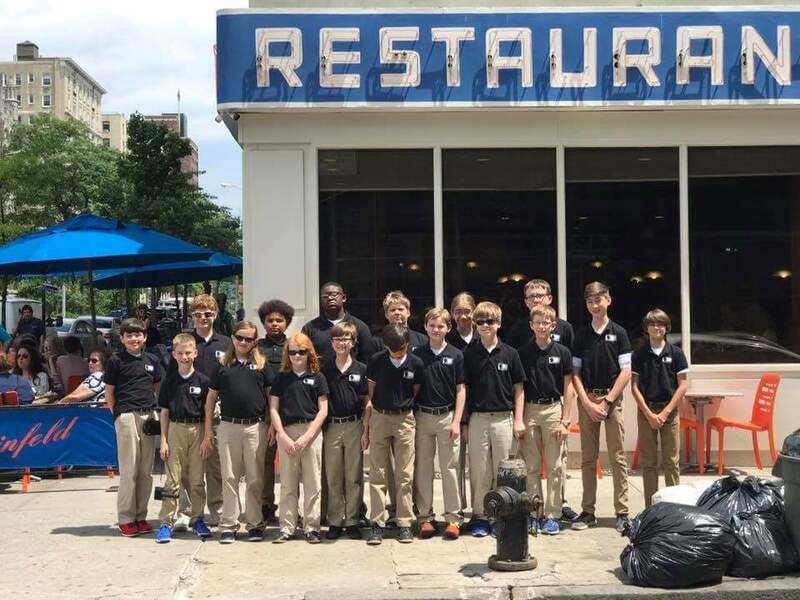 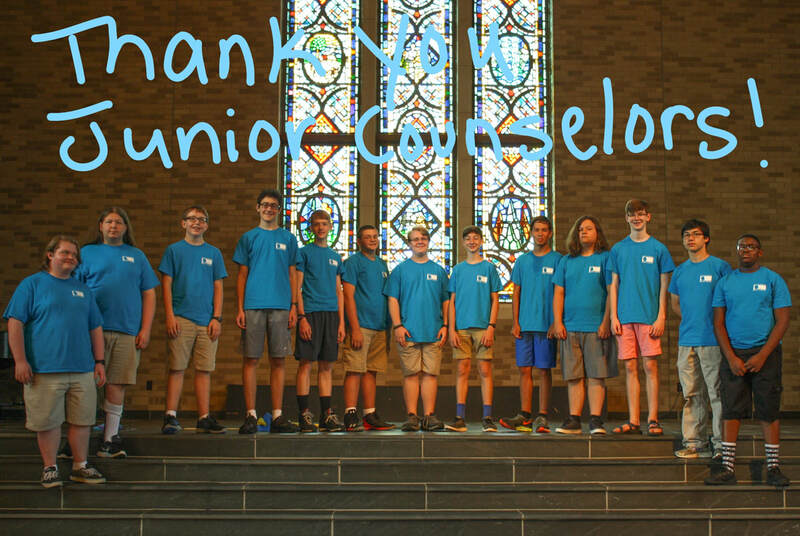 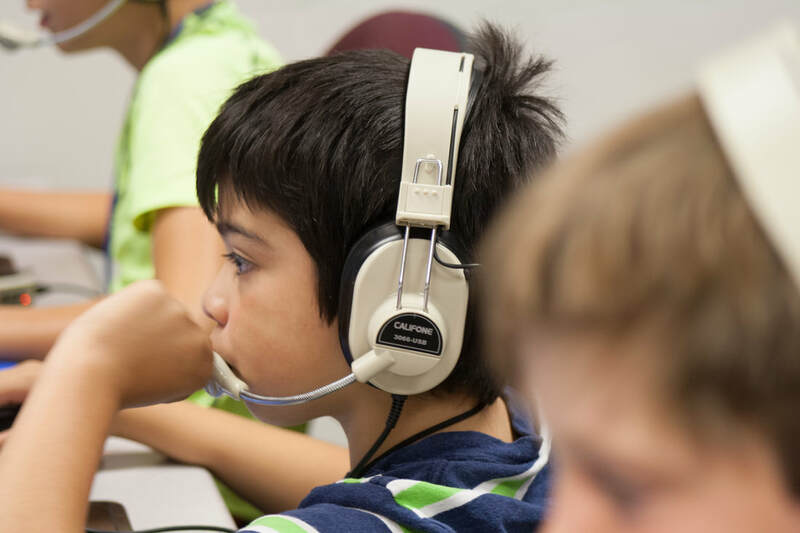 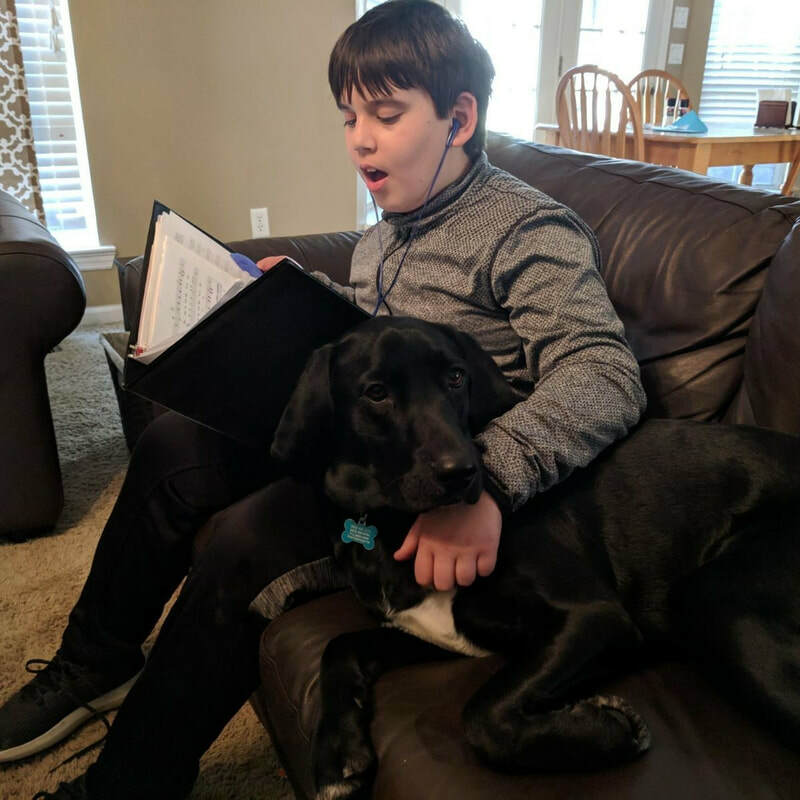 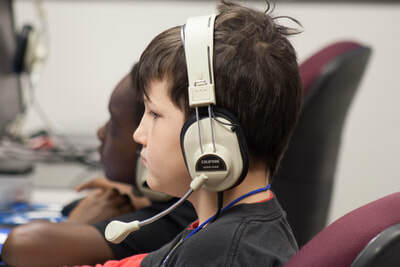 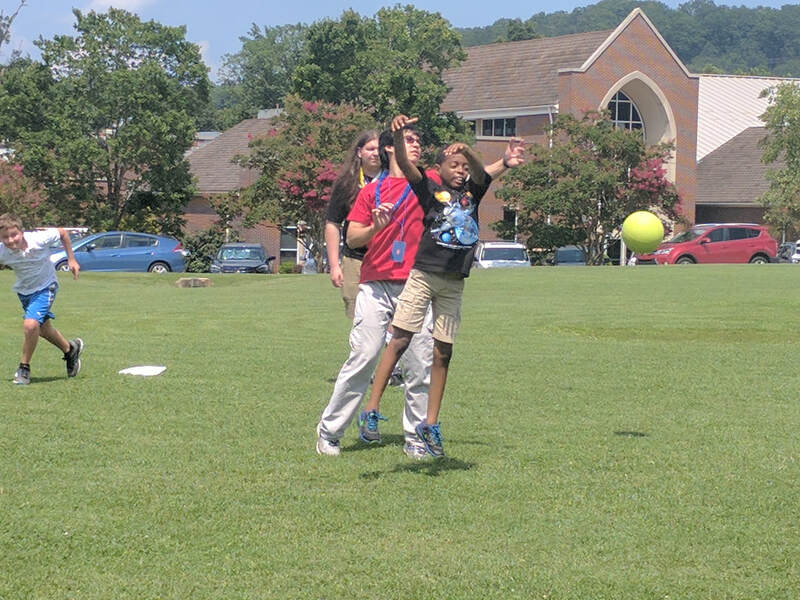 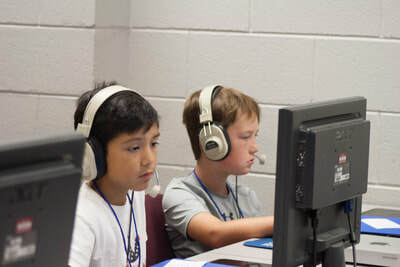 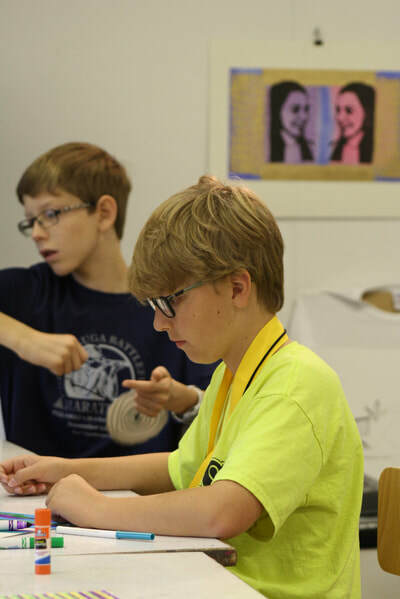 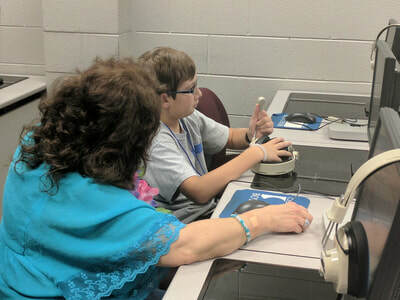 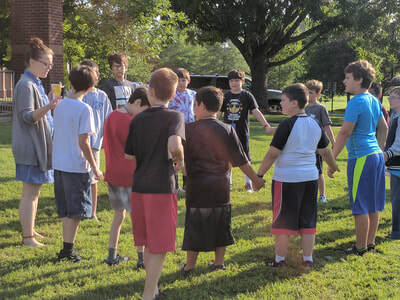 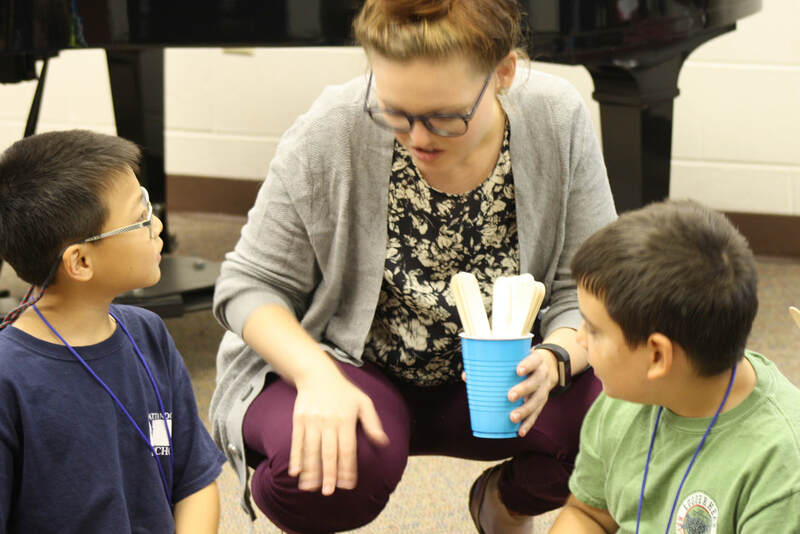 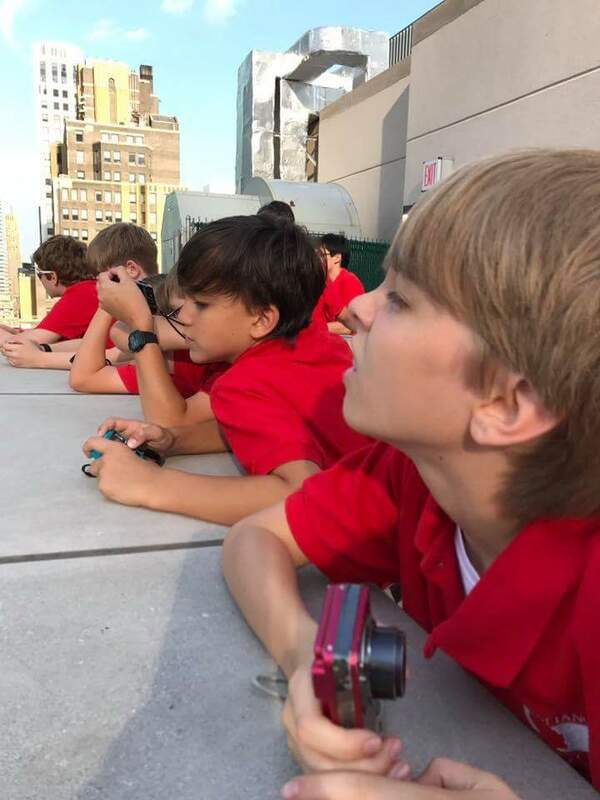 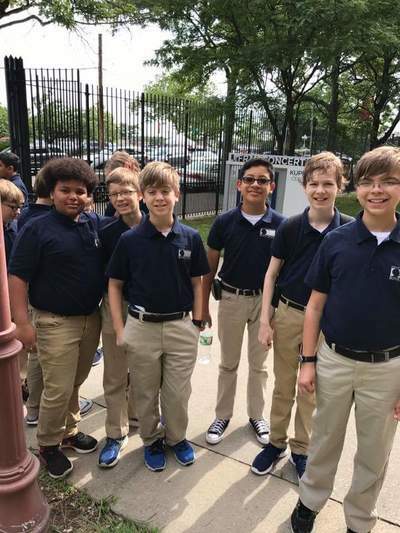 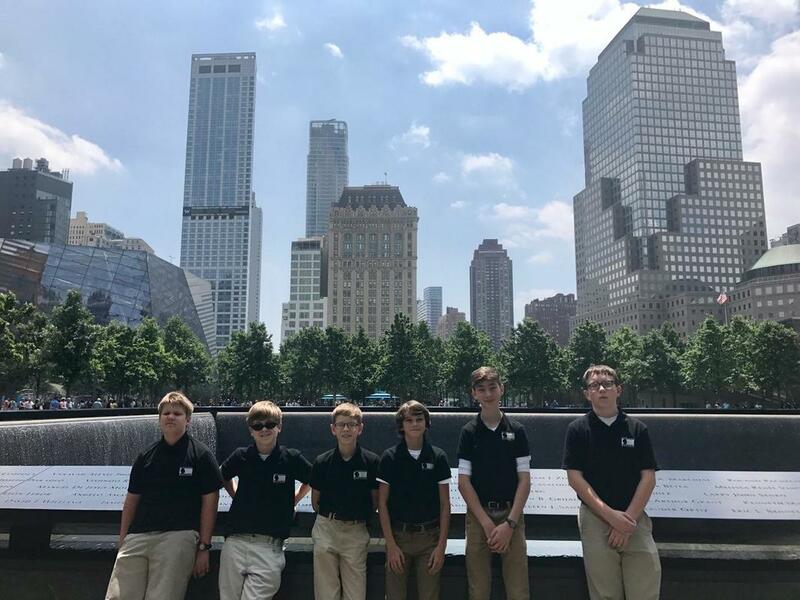 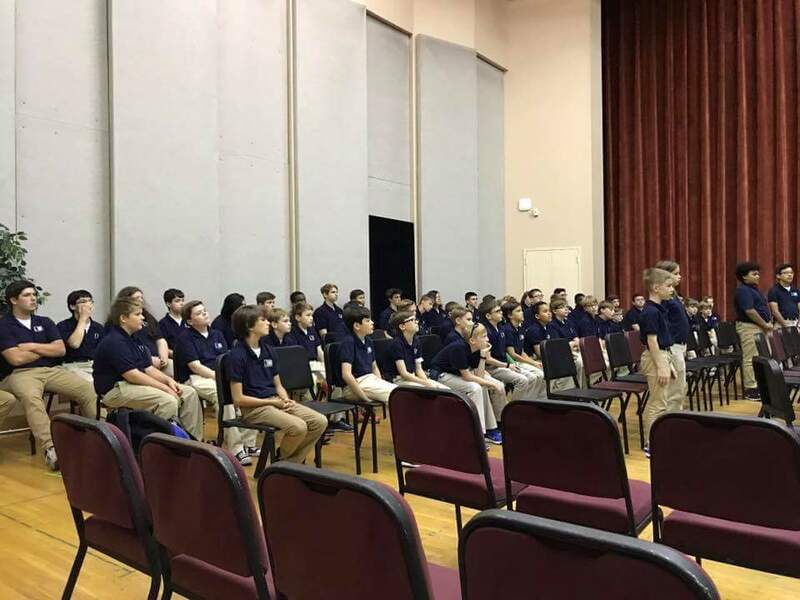 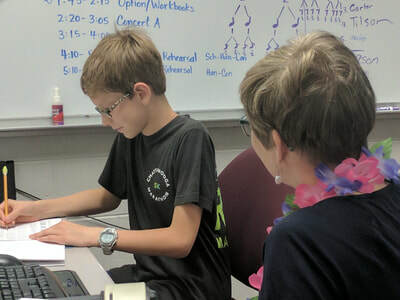 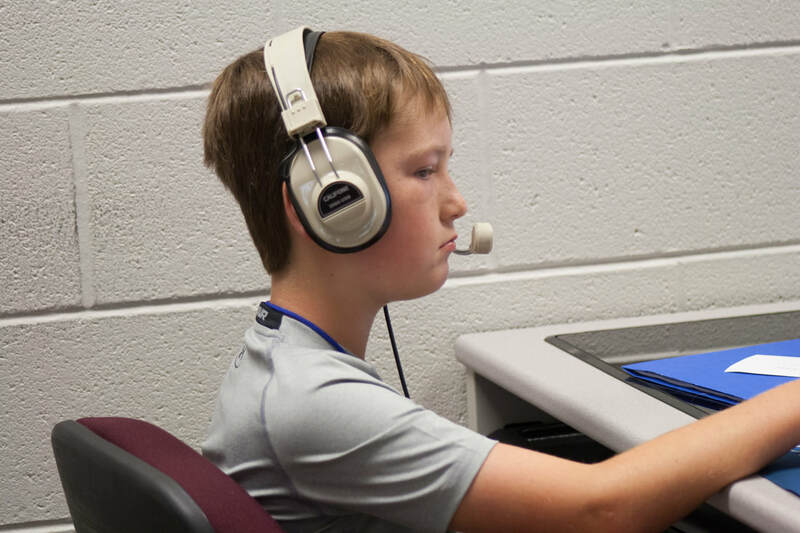 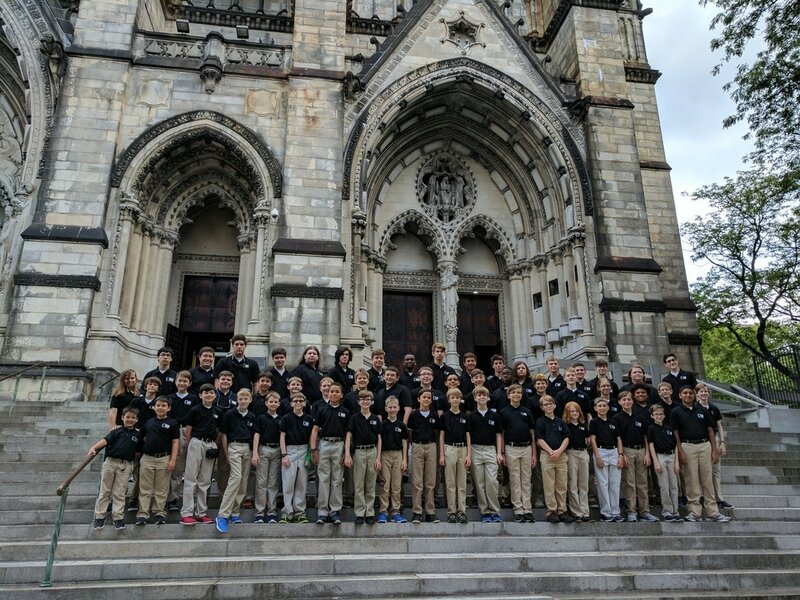 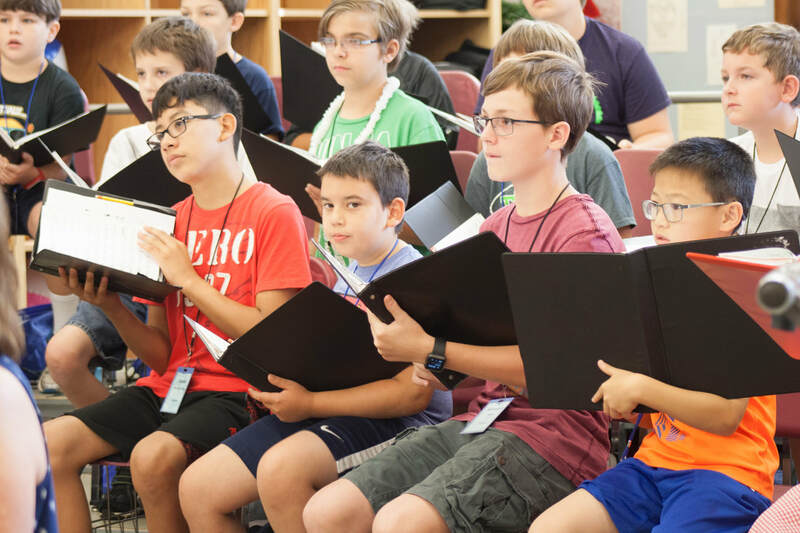 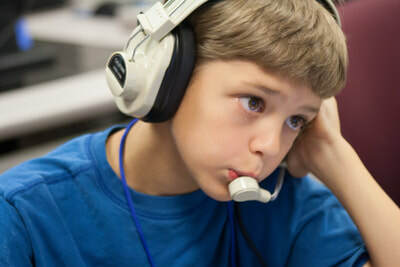 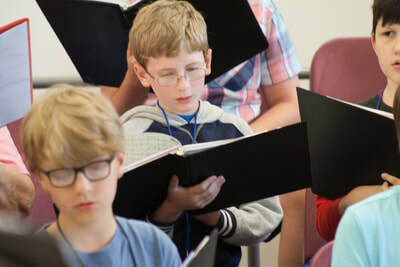 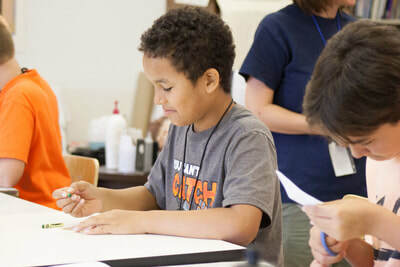 Participation in the Chattanooga Boys Choir is so much more than preparing repertoire and learning proper singing technique (though we’re certainly proud of those as well!). 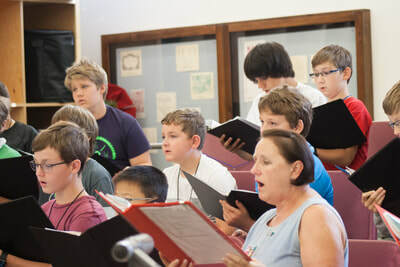 Singing in the choir is an exercise in effort and humility, grit and artistry, excellence and community that transcends the lone effort of any individual. 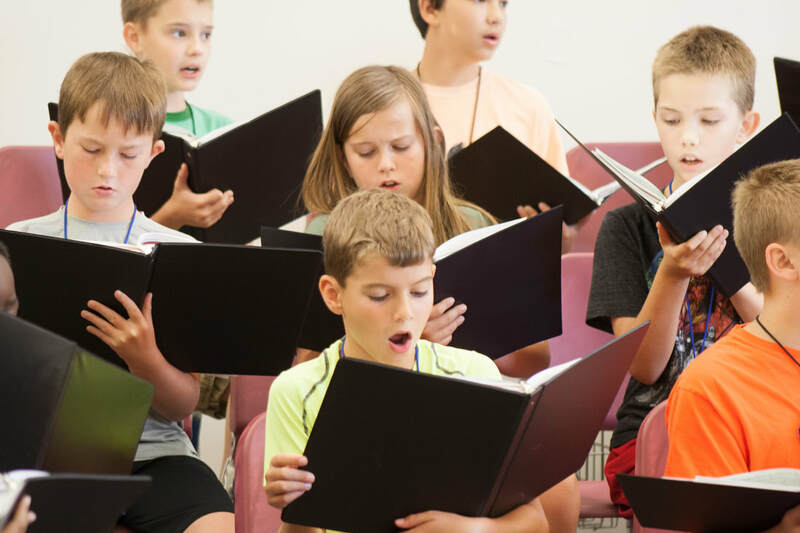 Numerous studies from recent years espouse the health benefits of singing, the increased neural activity observed in music-making, and the accelerated learning of the musically-oriented mind. However, I am reminded as we observe Rev. Dr. Martin Luther King, Jr. Day that being a part of the choir allows tremendous growth of the heart. As the boys breathe life into a variety of pieces from different cultures, languages, time periods, and perspectives, and as they work side-by-side with others to create beautiful moments which can never be replicated, they are participating in something that makes them not just better singers and musicians, but provides them with a foundation to be outstanding people and citizens. 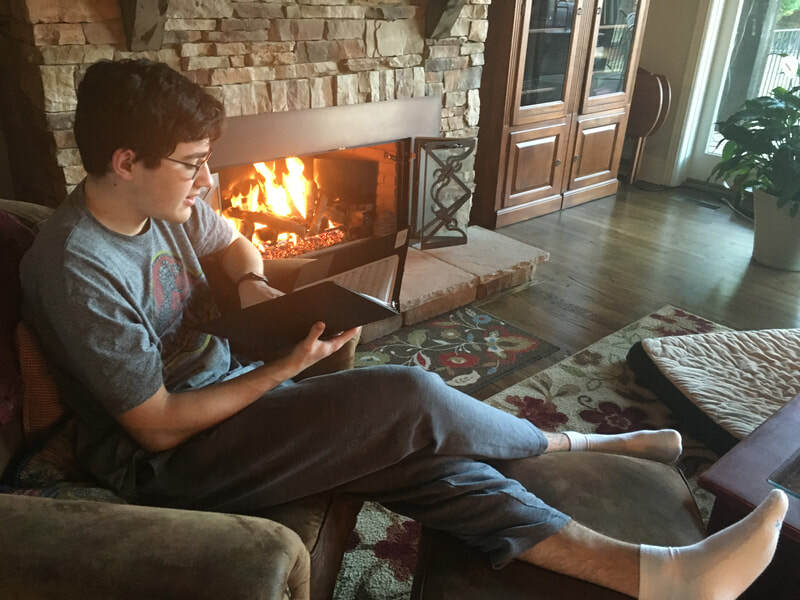 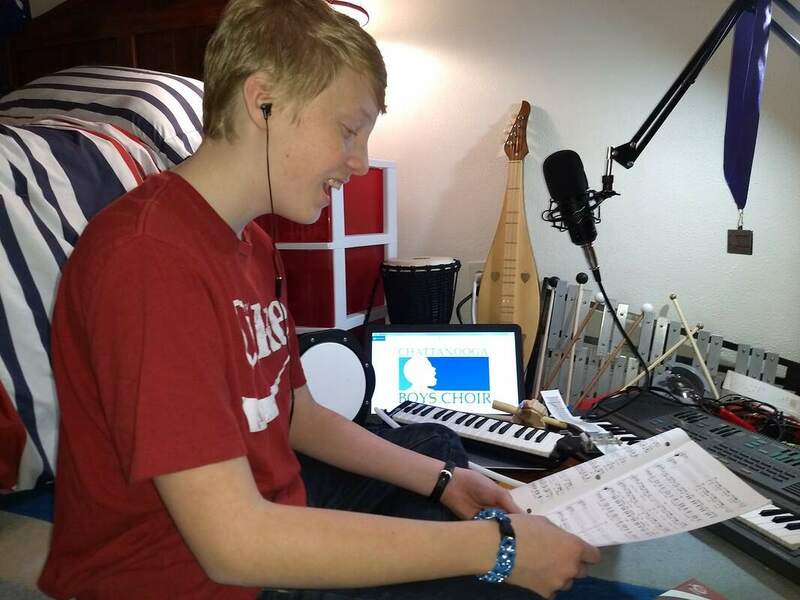 While “Aha!” moments of turning around and seeing the lyrics of a song you are singing emblazoned on the wall behind you are rare, it is not uncommon for the meaning and the message of such pieces to make their way from the boys’ voices and ears into their minds and hearts. Already this semester, we have explored the resiliency found in the African-American spiritual, the power of raising one’s voice in song, and celebrated the importance of community in Swahili (Sisi Ni Moja / “We Are One”). 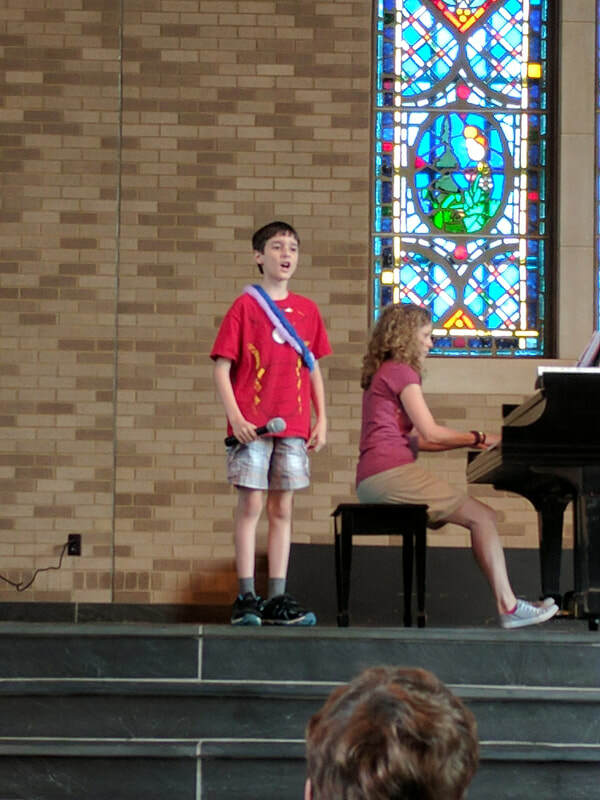 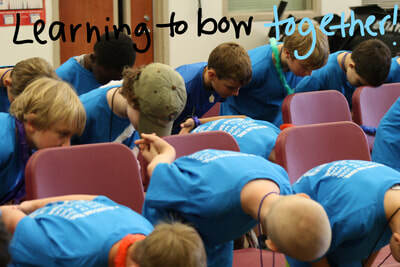 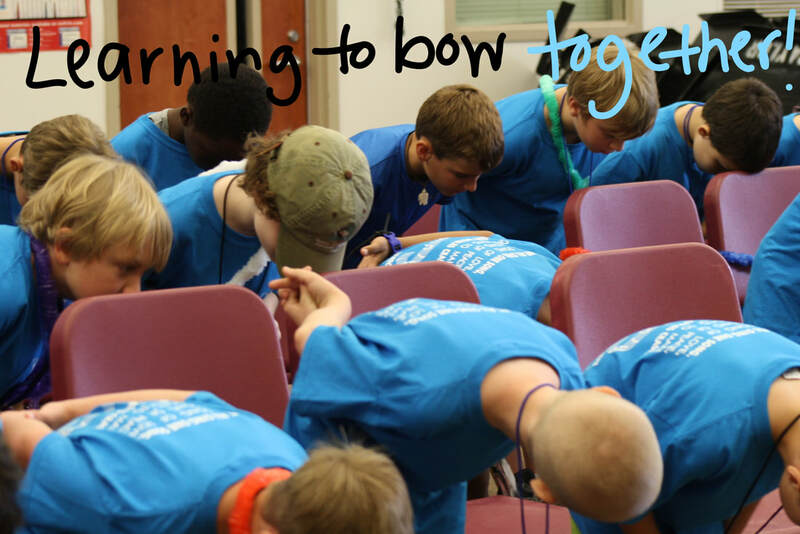 Thank you for allowing your chorister to participate in this exercise and find strength with one another as they lend their voice to the choir. 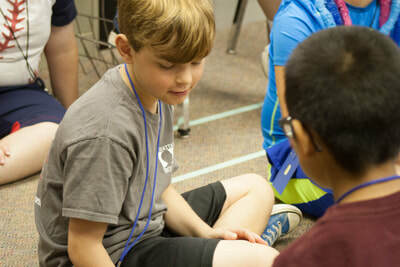 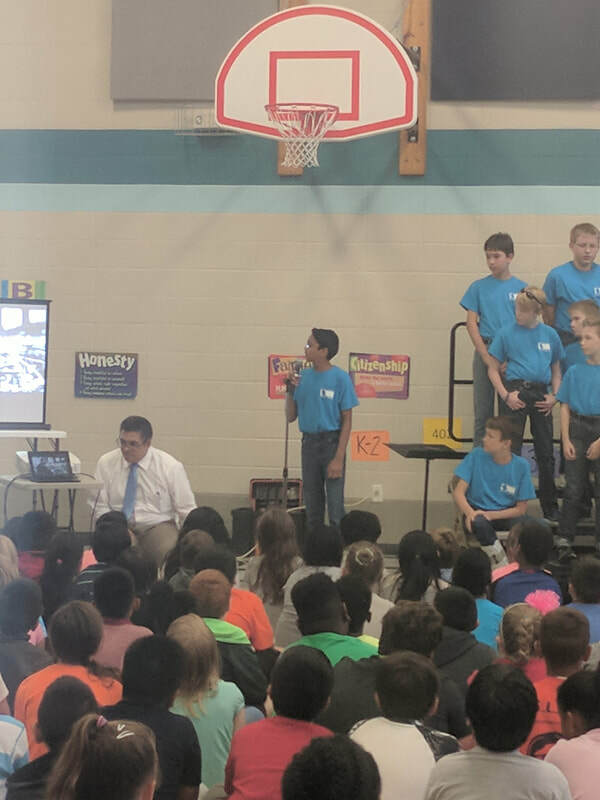 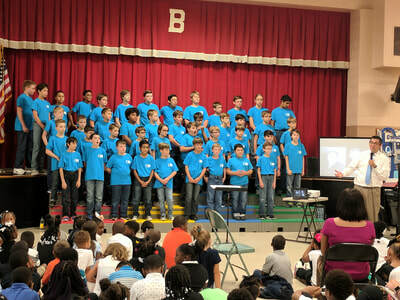 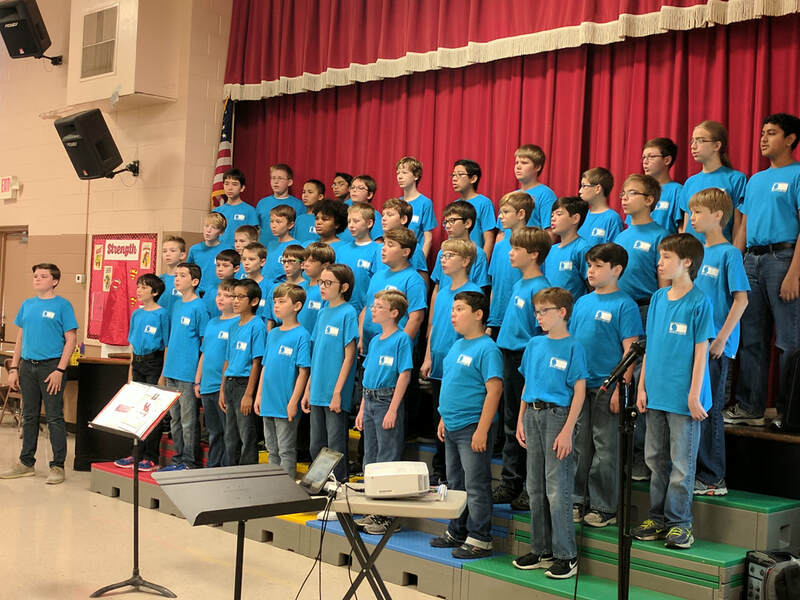 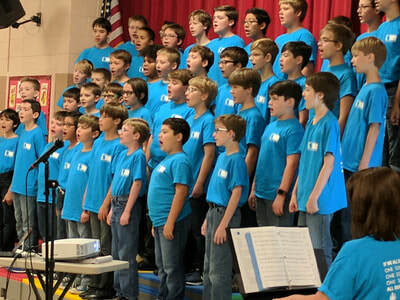 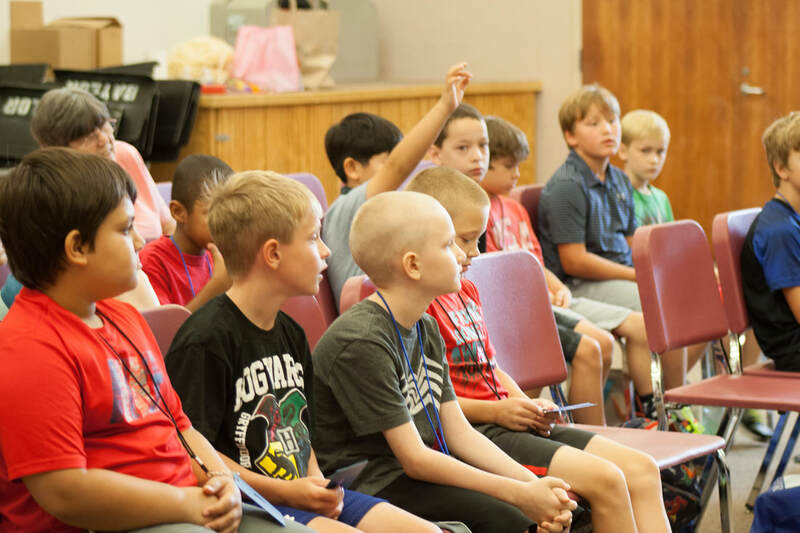 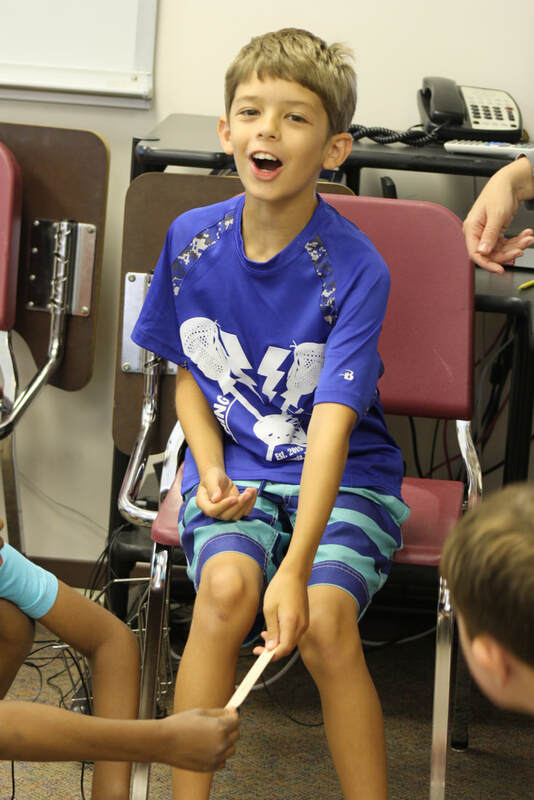 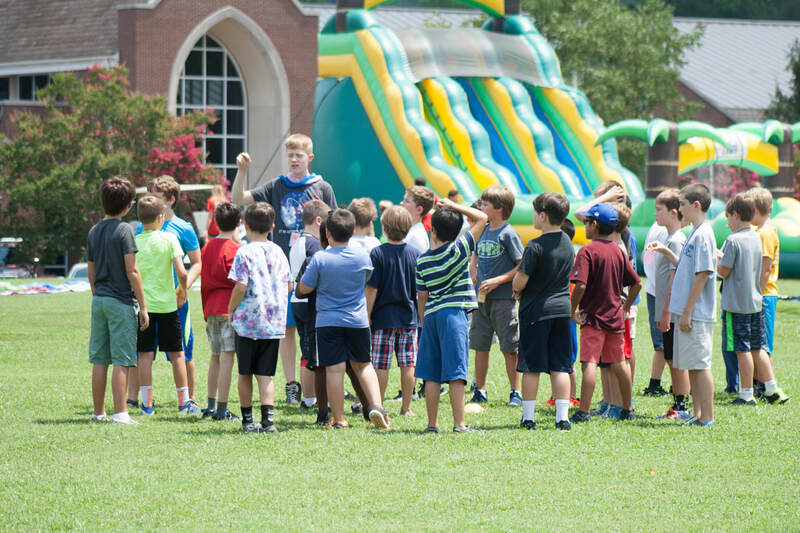 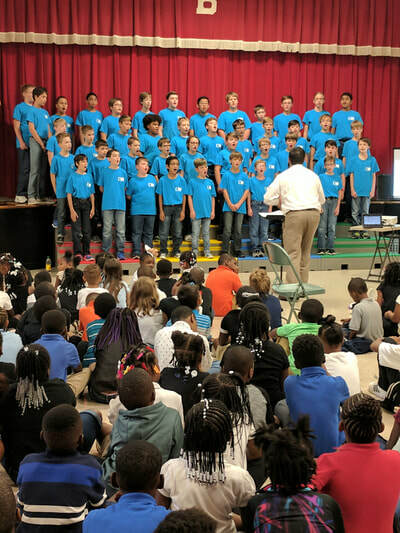 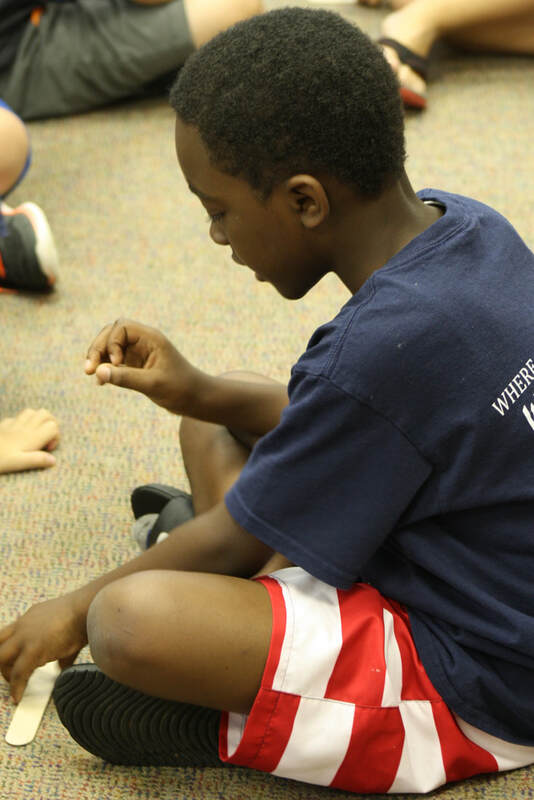 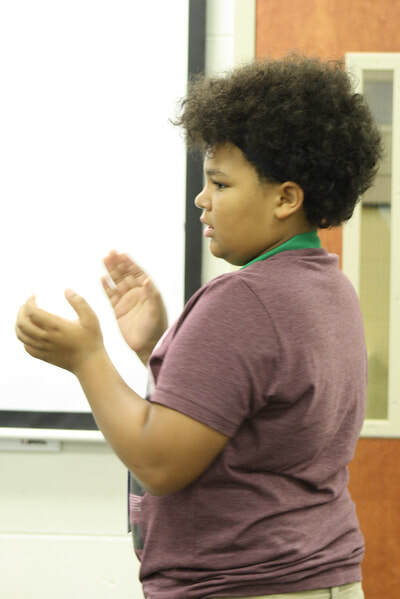 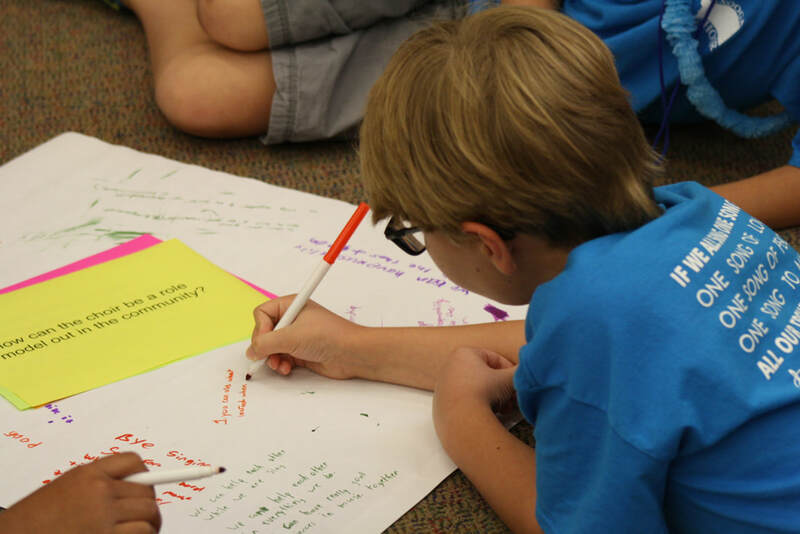 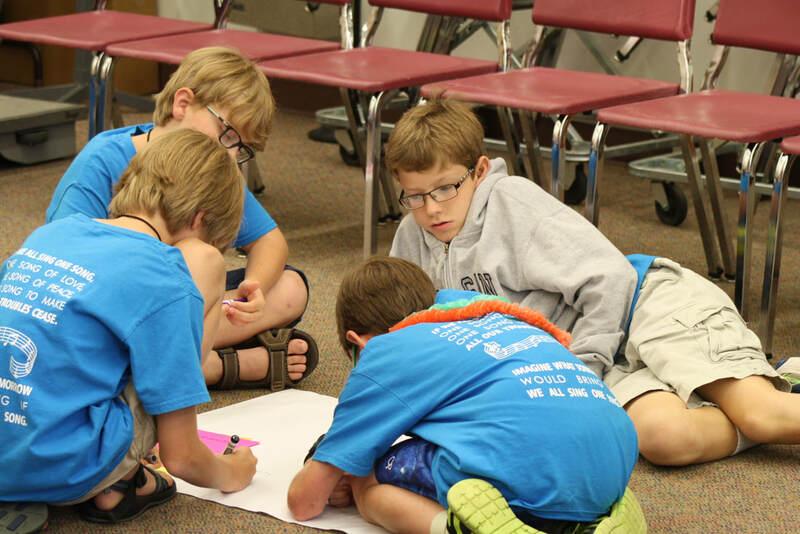 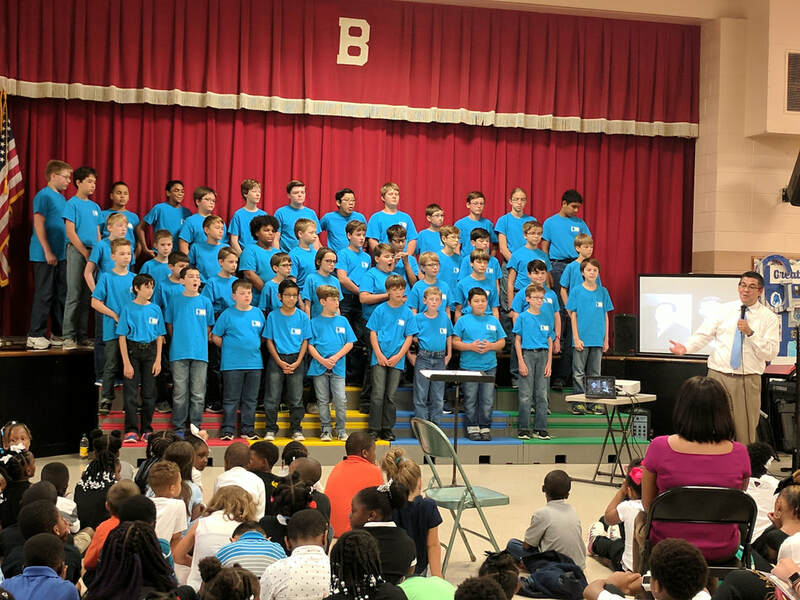 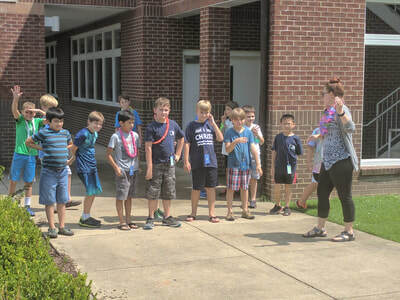 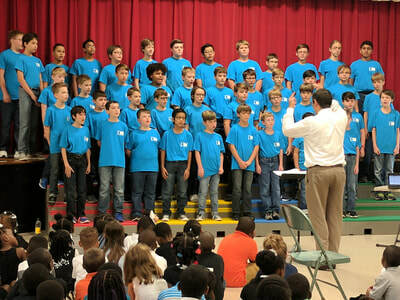 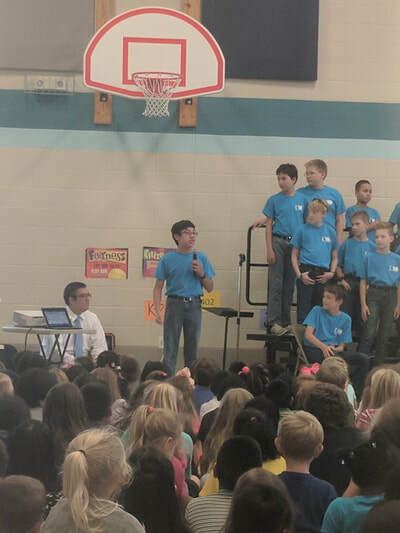 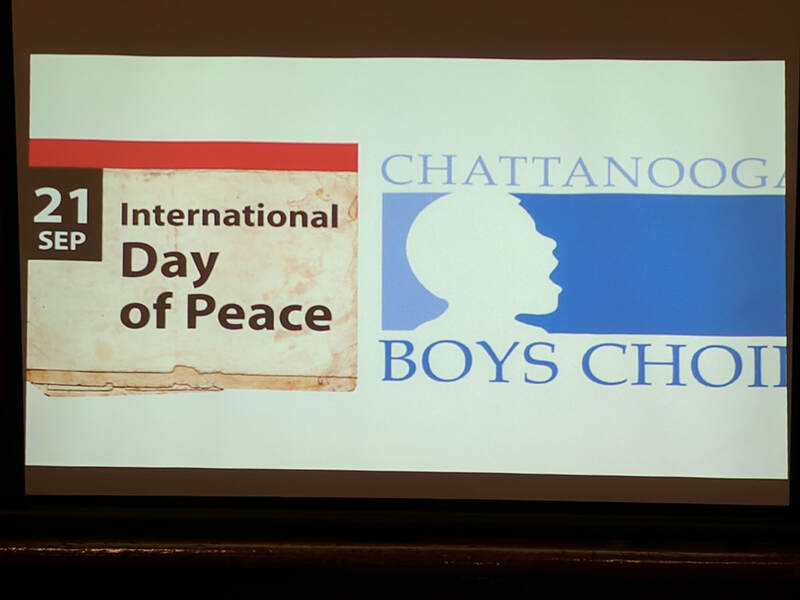 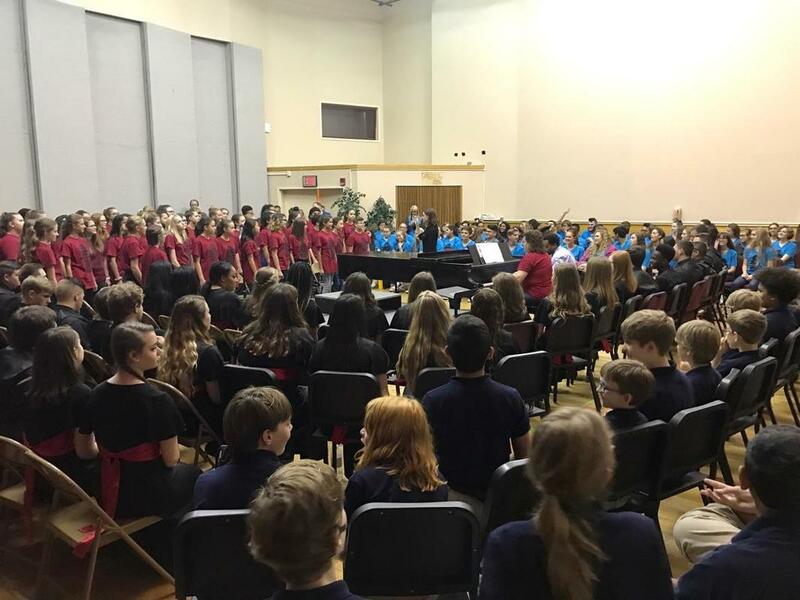 The Chattanooga Boys Choir celebrated World Peace Day on Thursday, September 21 by presenting "Symphony of the Heart: Songs for the International Day of Peace" at Barger Academy and East Ridge Elementary schools. 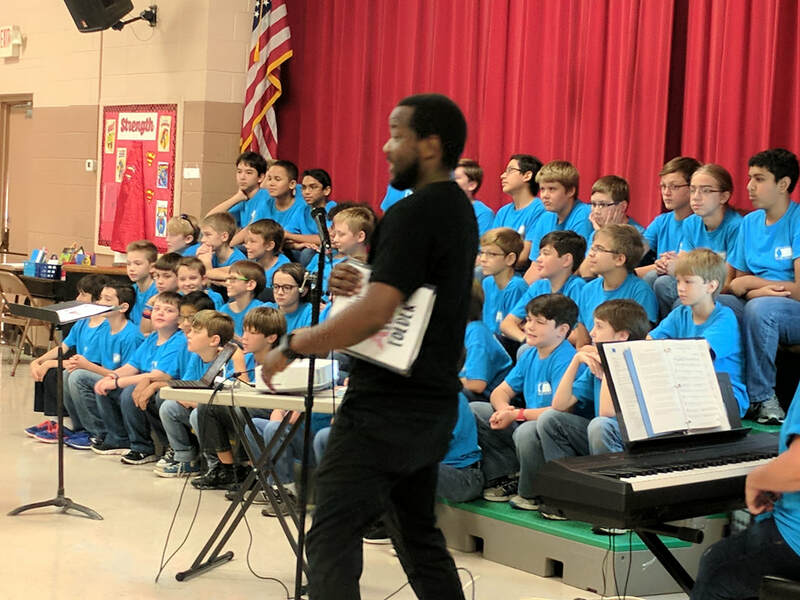 Pieces of Andre Thomas, Rollo Dilworth, Jim Papoulis, and others, as well as the #AVoice4Peace inspired "Ukuthula" with hundreds of AMAZING elementary school students. Thank you, Kevin Fenton, for the inspiration, to Charlene Potts and Michael Mitchel for their assistance and incredible devotion to their students and schools, and the CBC staff for their work with our CBC ambassadors of peace! "***In my heart I can hear it…I hear a symphony. 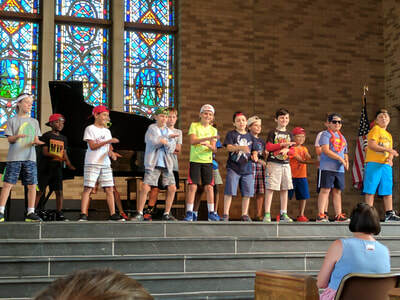 All of the instruments are playing the same song. 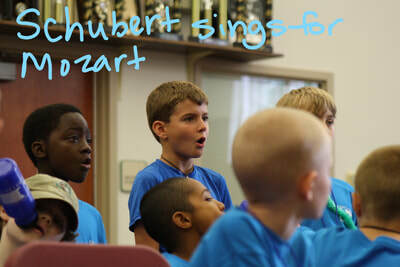 ***Lift ev’ry voice and let us sing! 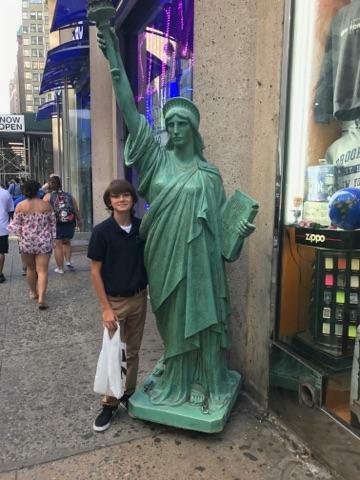 In ev’ry song let freedom ring! 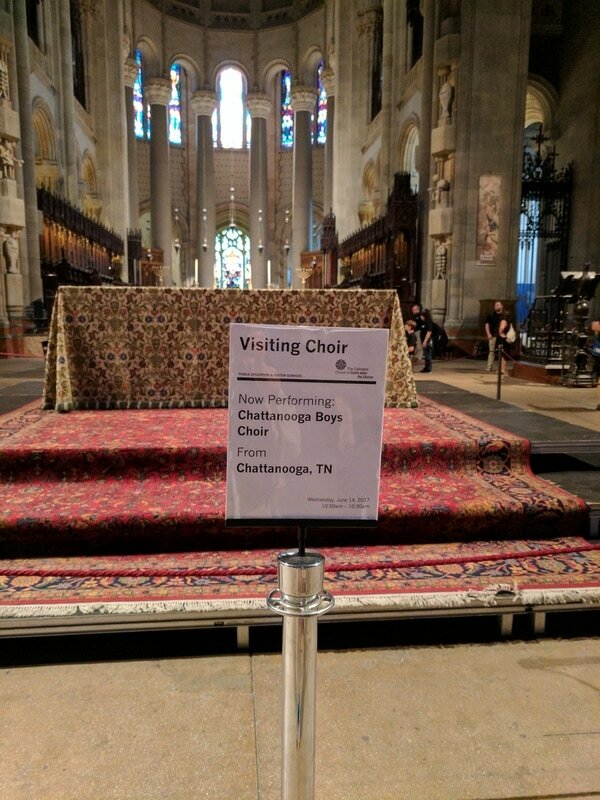 From ev’ry soul comes a noble dream. 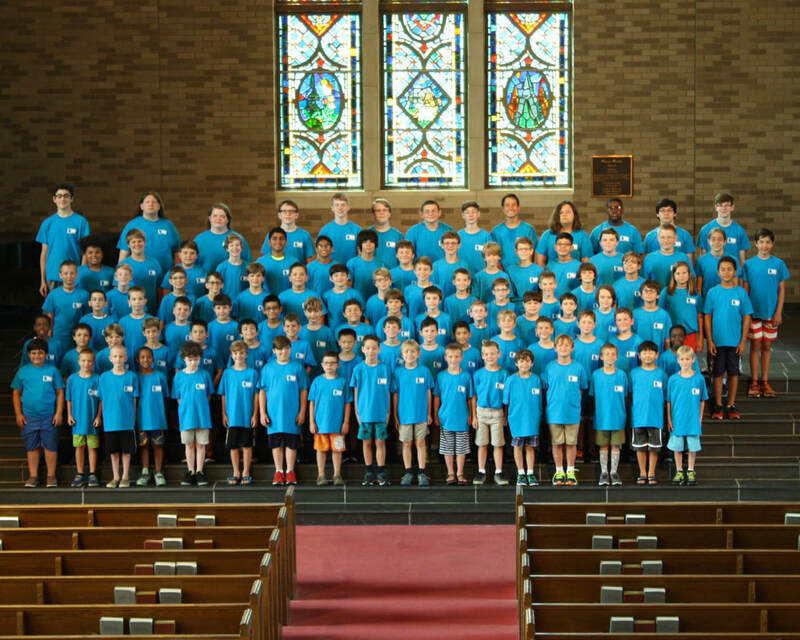 Another week of summer camp is in the books! 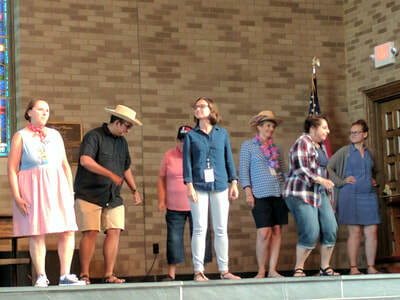 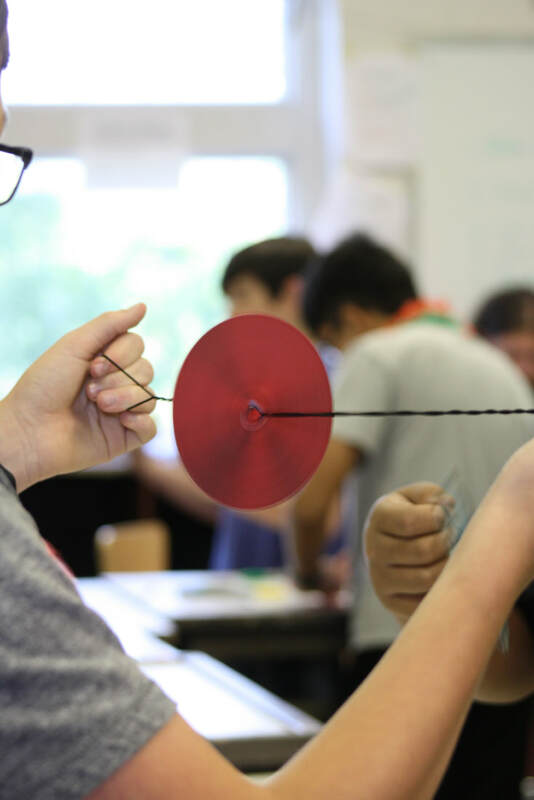 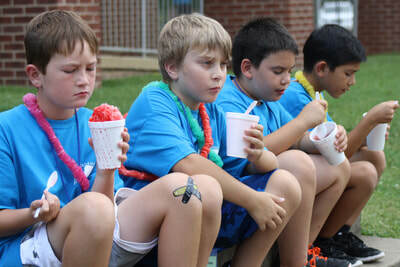 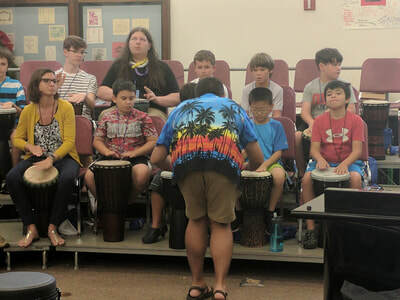 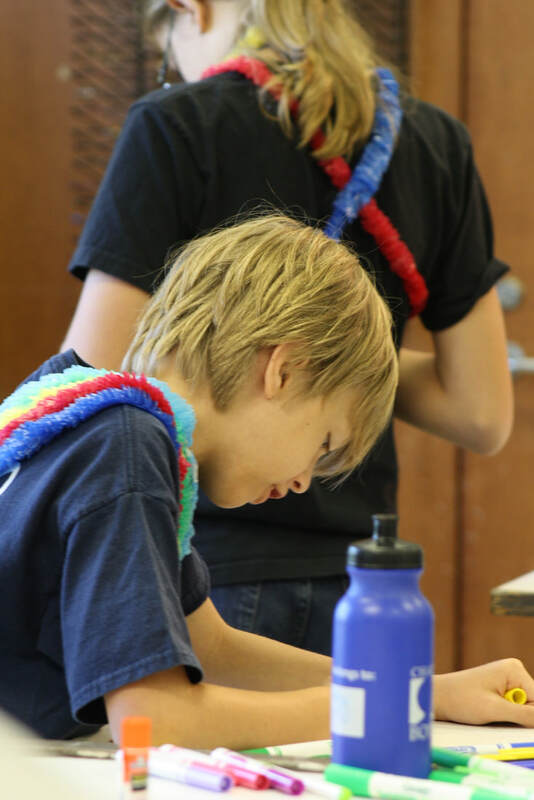 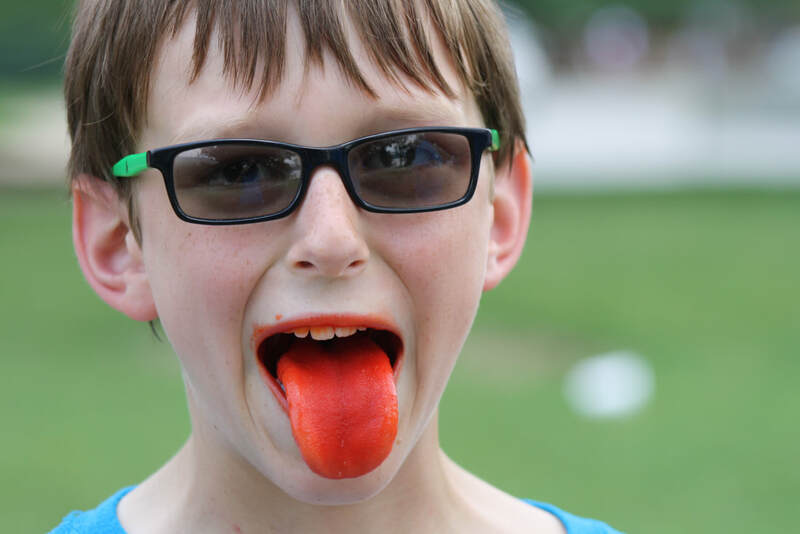 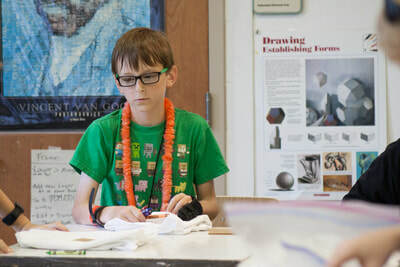 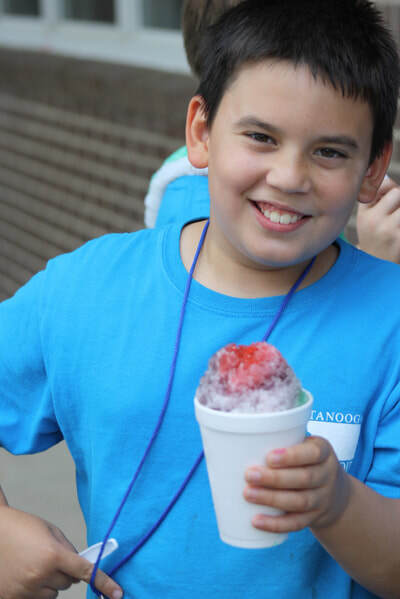 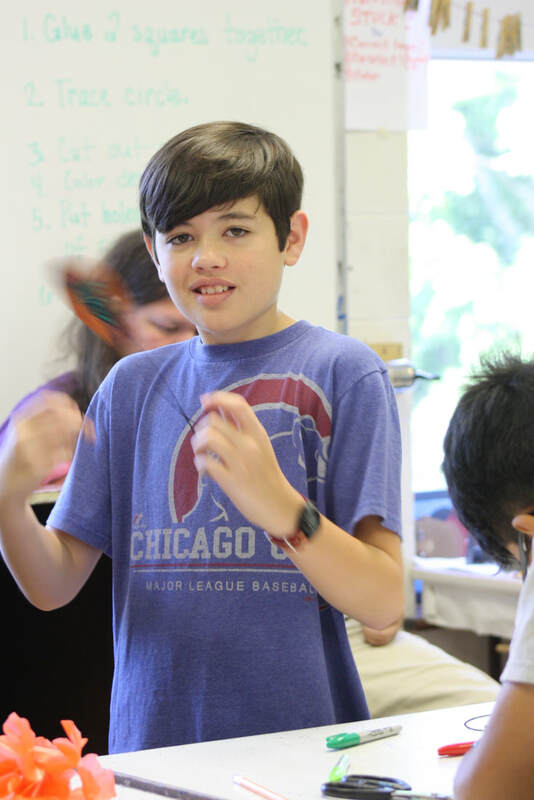 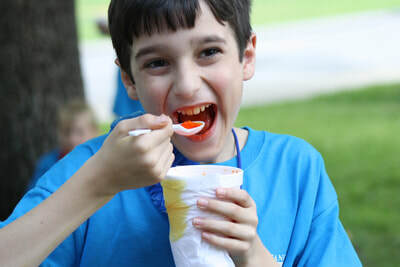 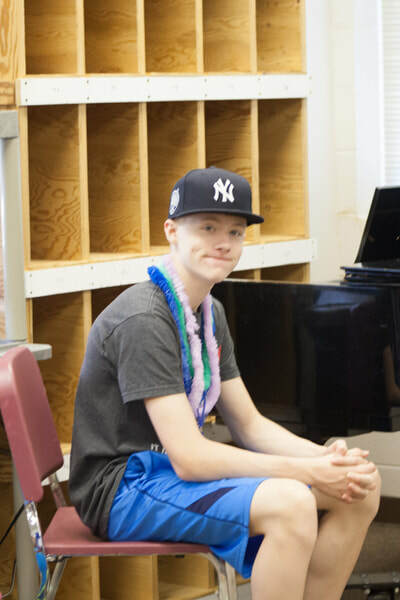 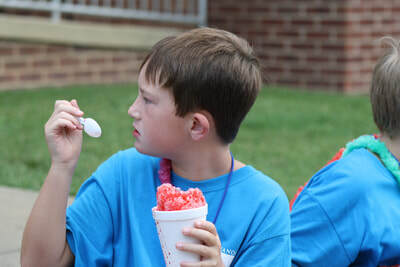 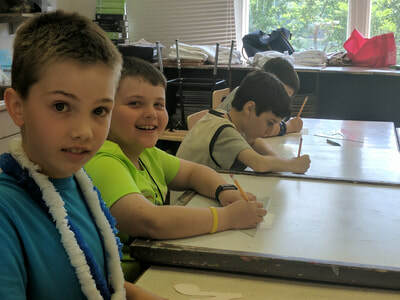 The week was full of rehearsals, theory classes, theory lab, team building games, art projects, swimming, slip-n-slide, a Talent Show, Skit Night, drumming classes, and of course, Mr. Henderson's Shaved Ice! 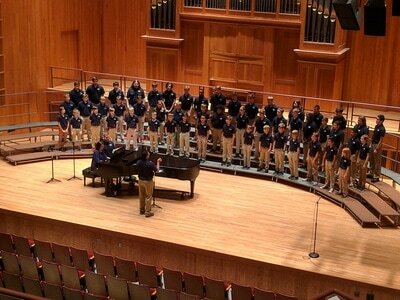 Today was spent at the Aaron Copeland School of Music at Queens College. 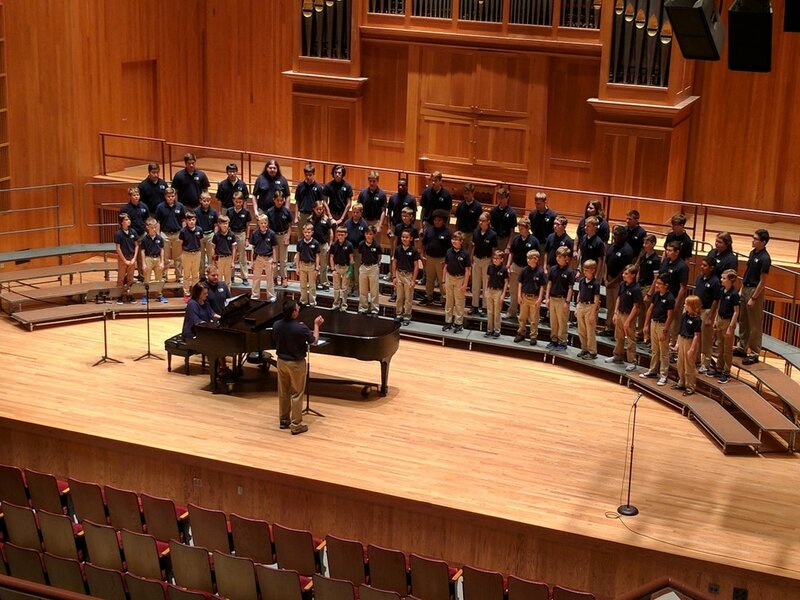 Following a quick warm up, the choir was escorted onto stage at the LeFrak Concert Hall where they performed four selections from the summer tour repertoire. 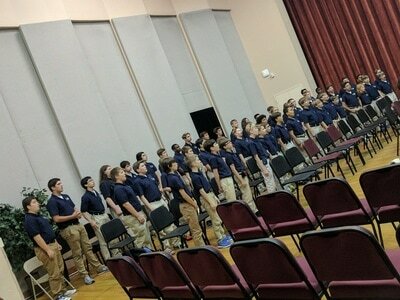 The rest of the day was spent in workshops with clinicians and listening to other choirs perform. 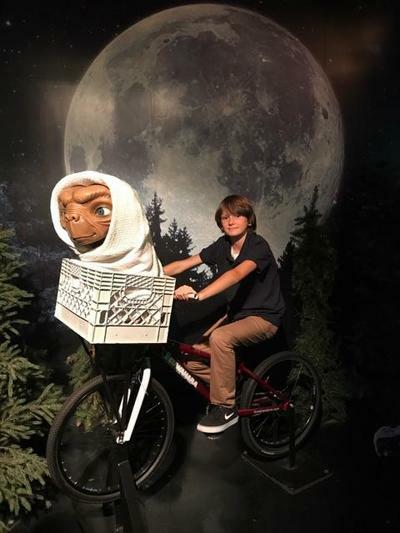 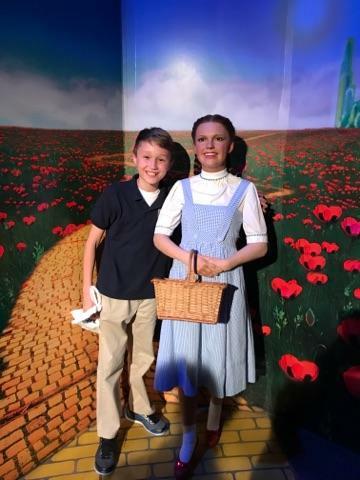 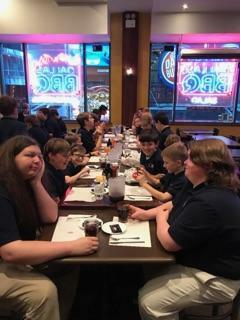 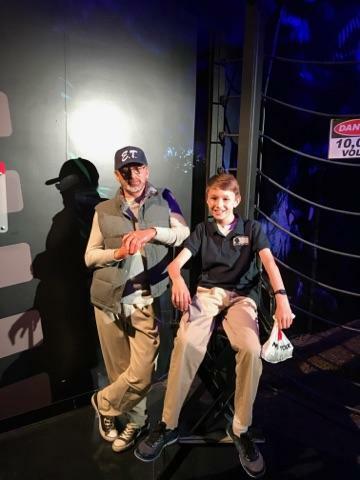 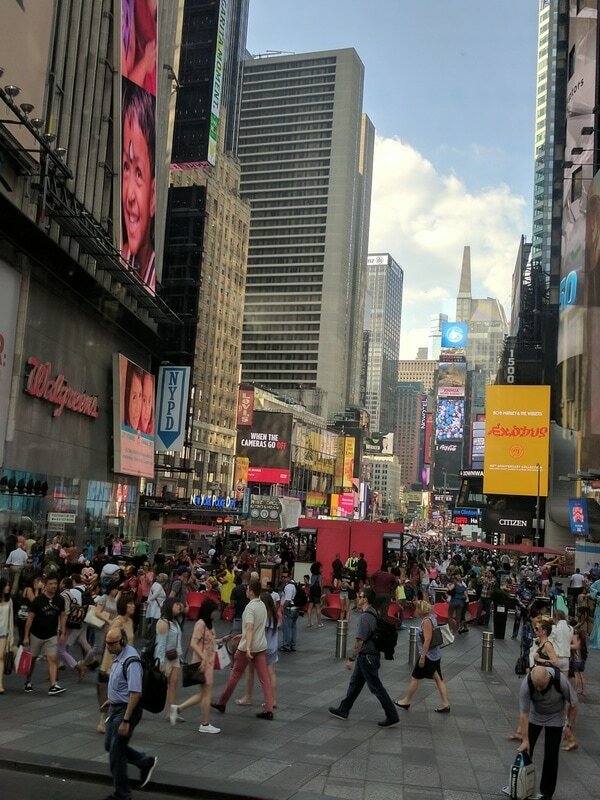 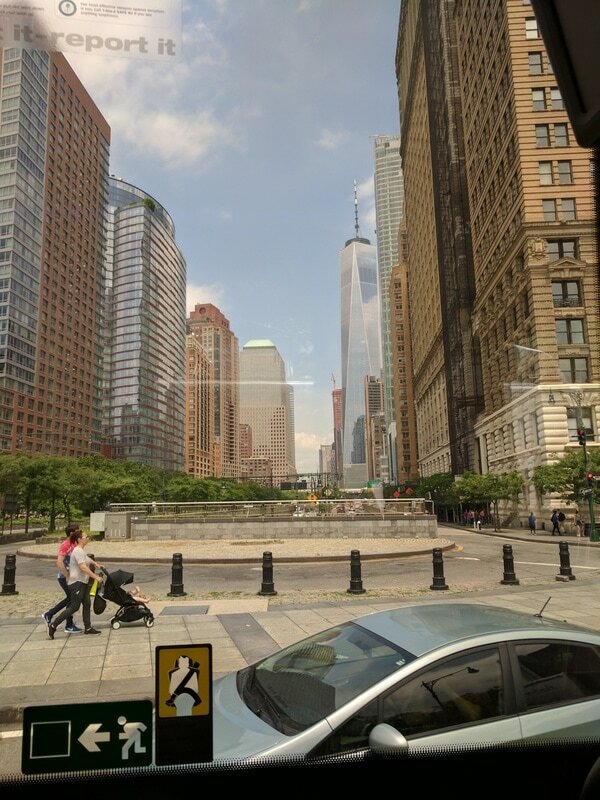 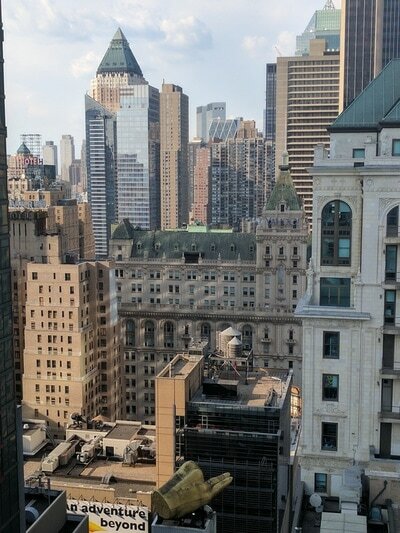 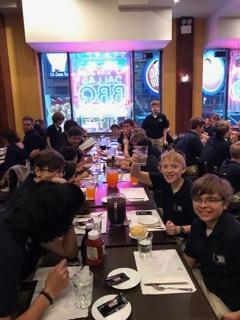 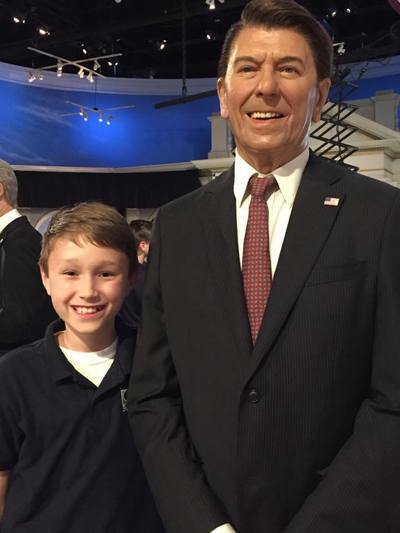 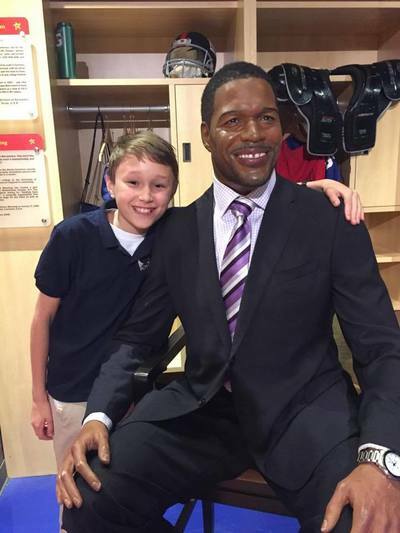 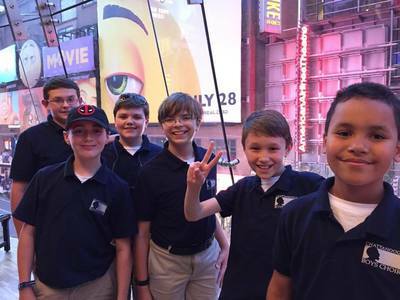 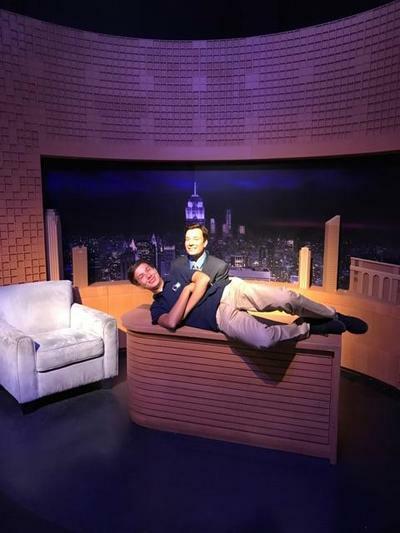 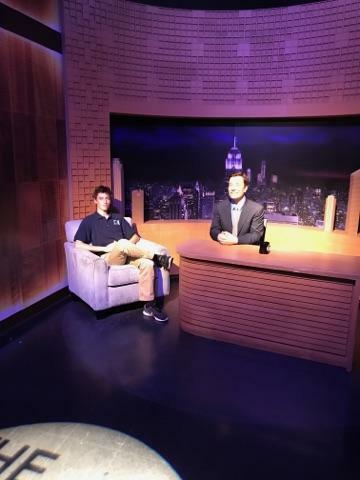 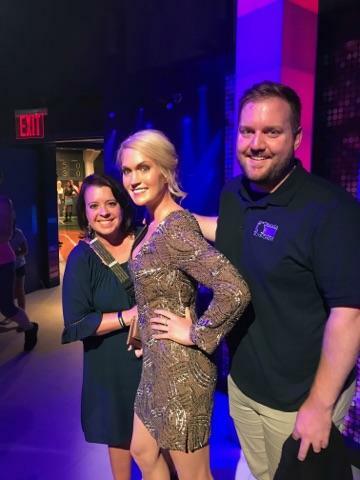 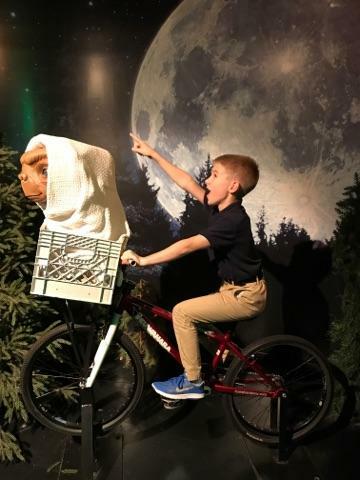 The boys ended the day back in the Times Square area with a little bit of souvenir shopping, dinner at Dallas BBQ, and celebrity spotting at Madame Tousseau's Wax Museum. 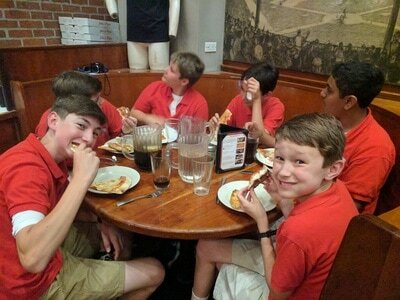 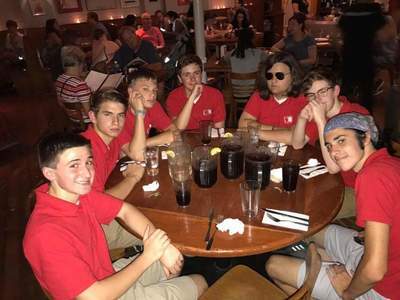 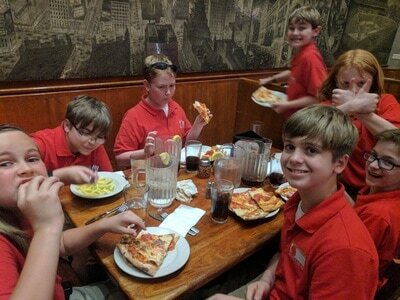 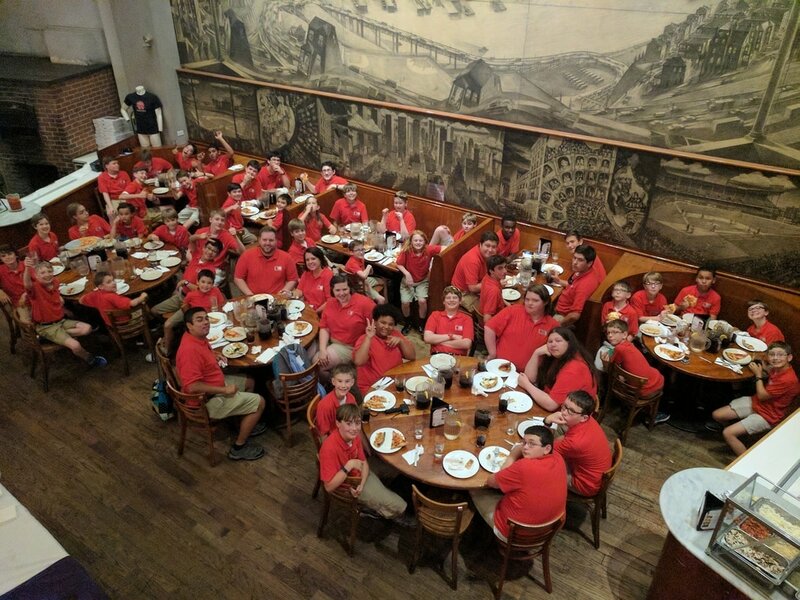 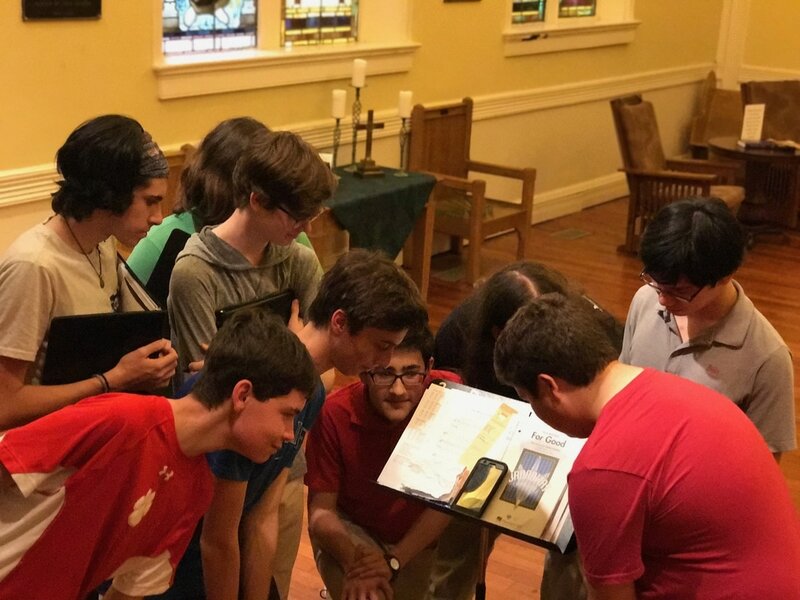 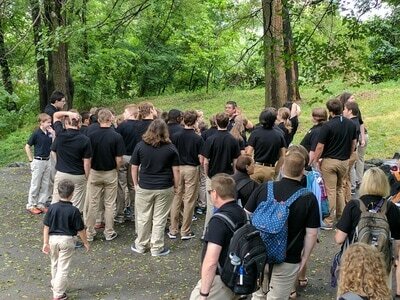 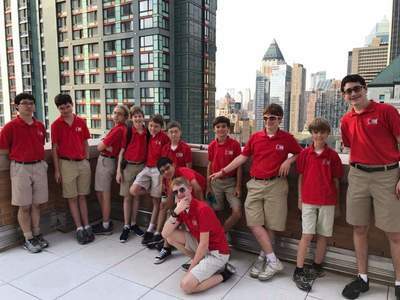 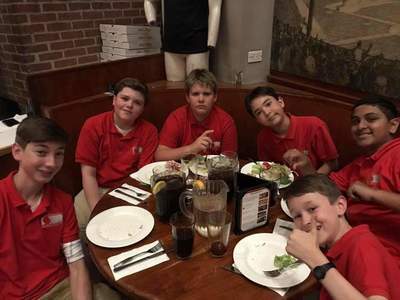 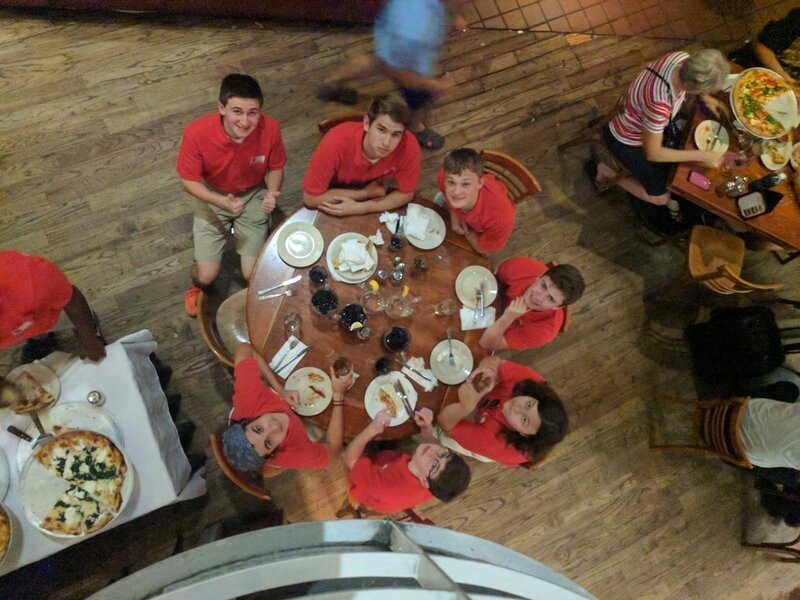 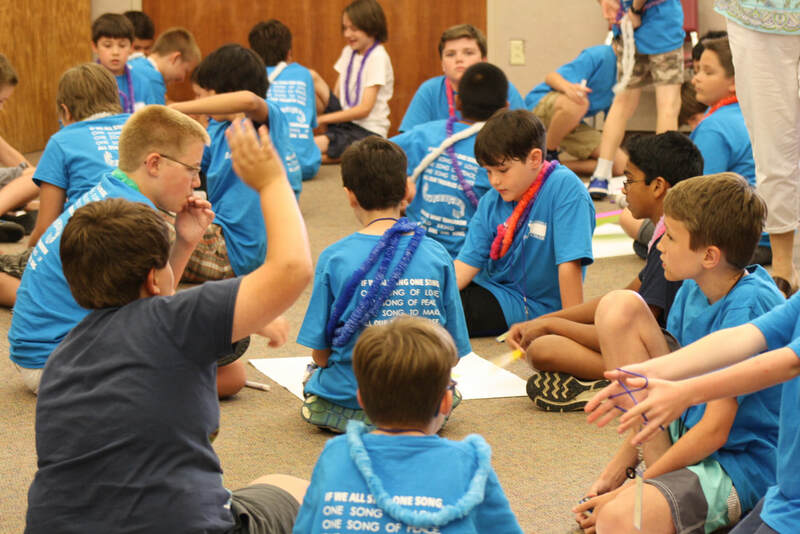 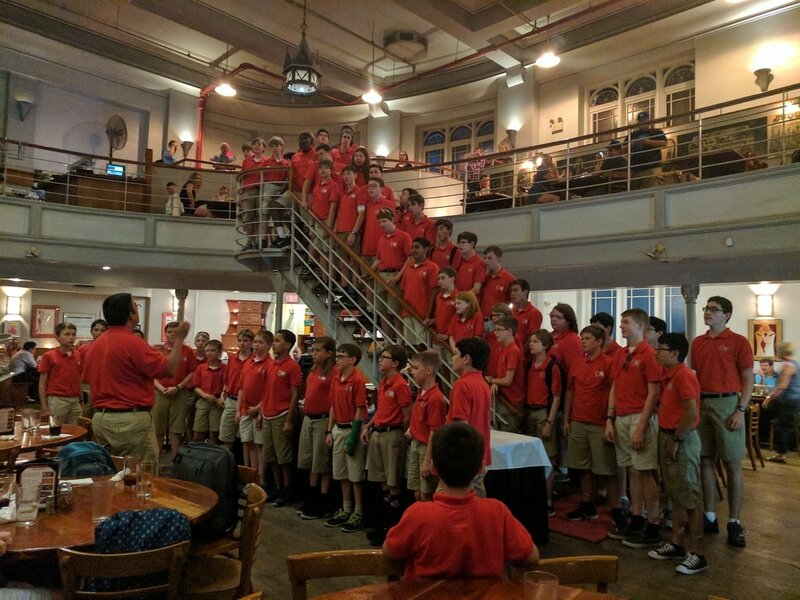 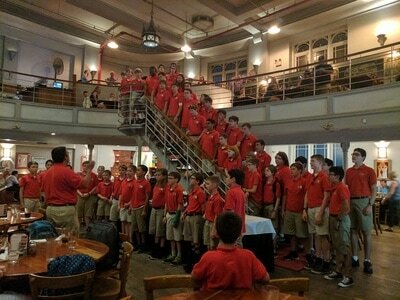 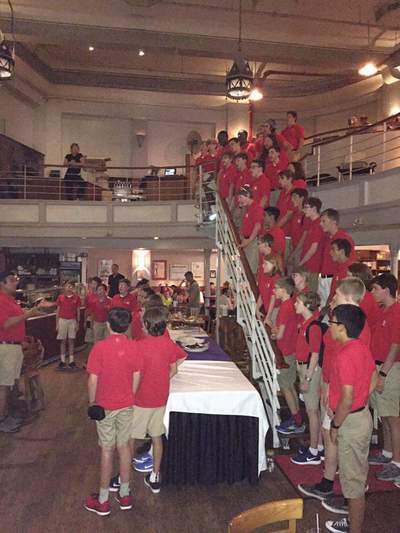 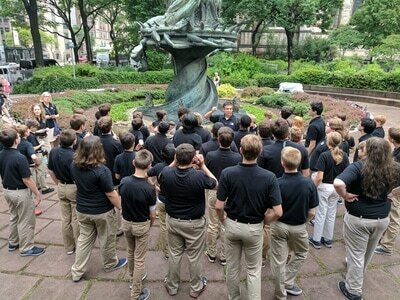 One of the traditions of touring with the Chattanooga Boys Choir is the "evening meeting," typically in the lobby of a hotel at the end of the day. The events of the day are recounted, details for the following day discussed, and questions answered. 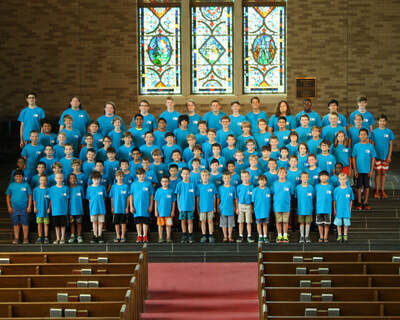 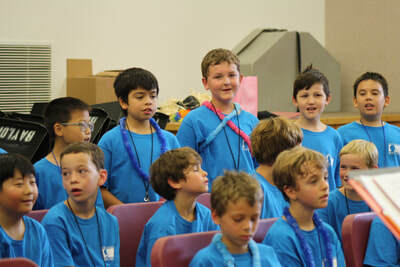 This year there are 53 choristers on tour, a record number, with a typical roster closer to 35 choristers. A group of that size presents numerous challenges from requiring 2 coaches to not being able to cross the streets in NYC at one time. 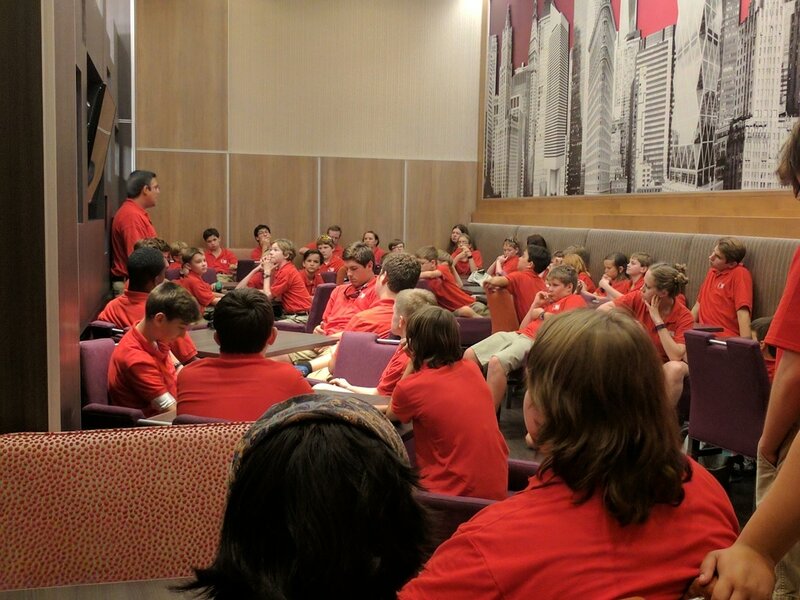 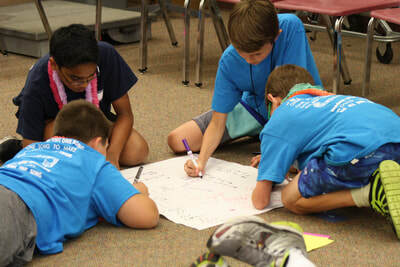 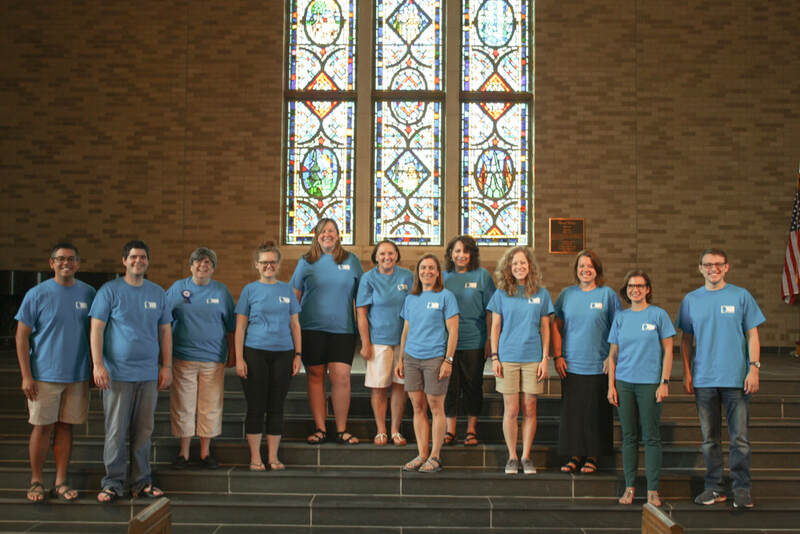 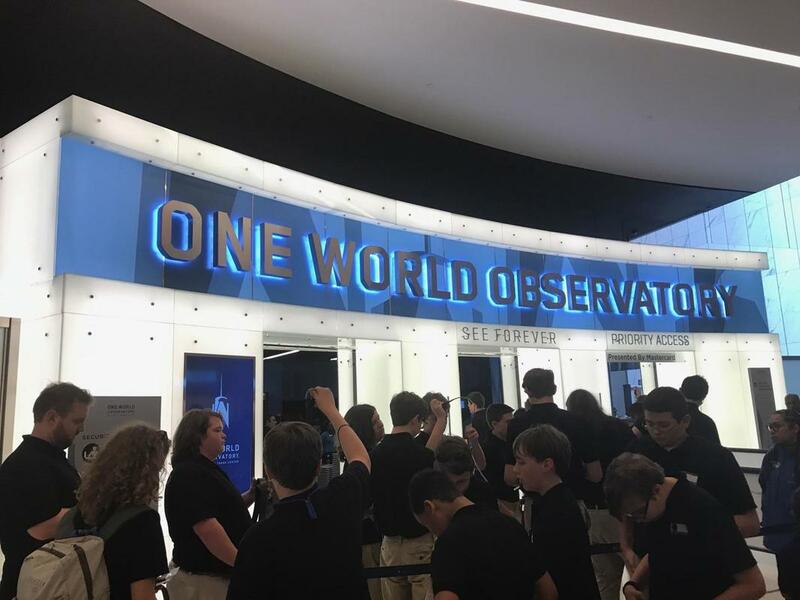 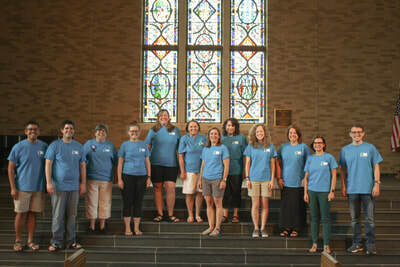 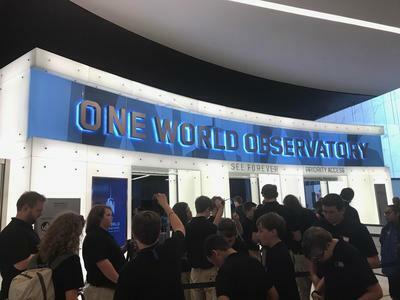 In the "evening meeting" on the first day of tour, chaperones had an opportunity to discuss any concerns they observed over the course of the day. 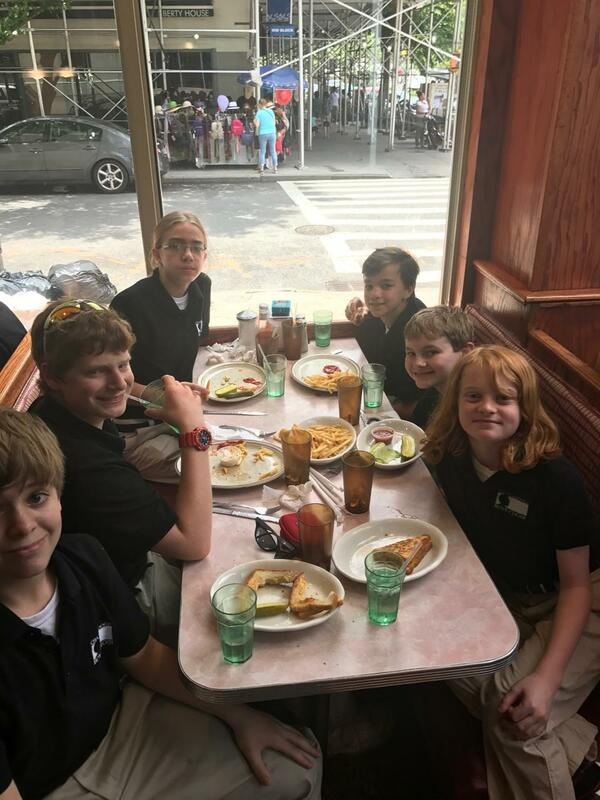 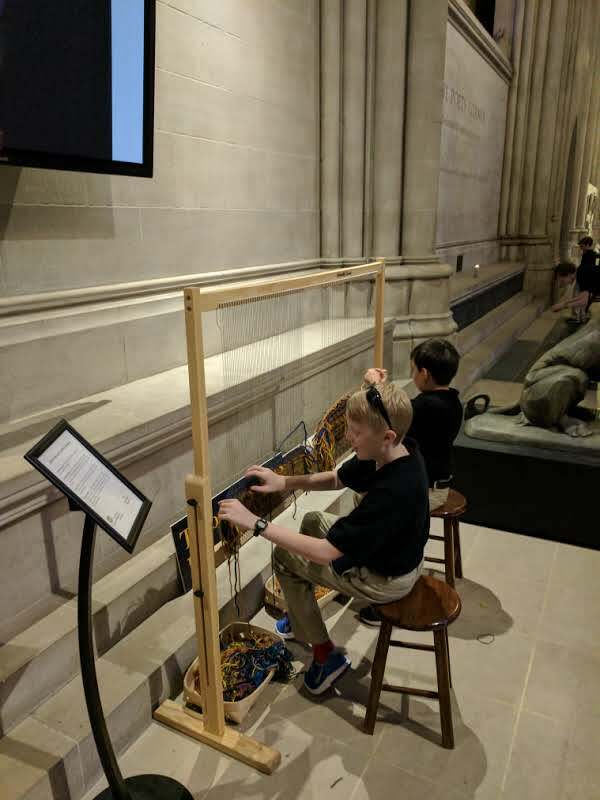 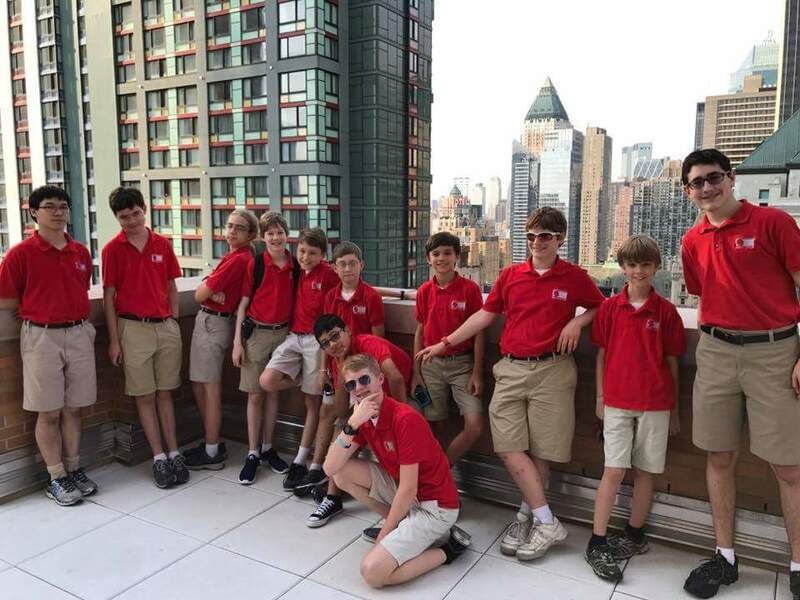 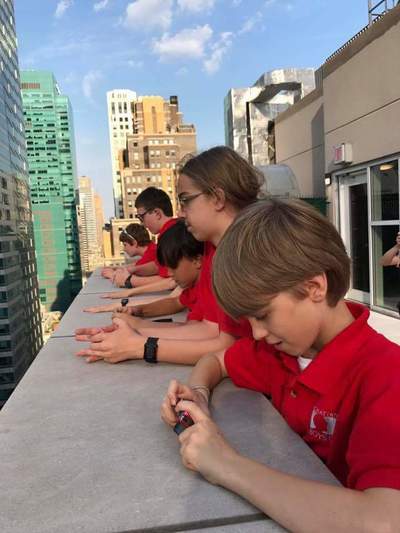 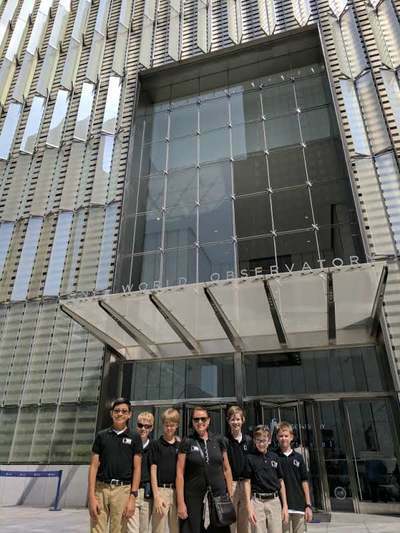 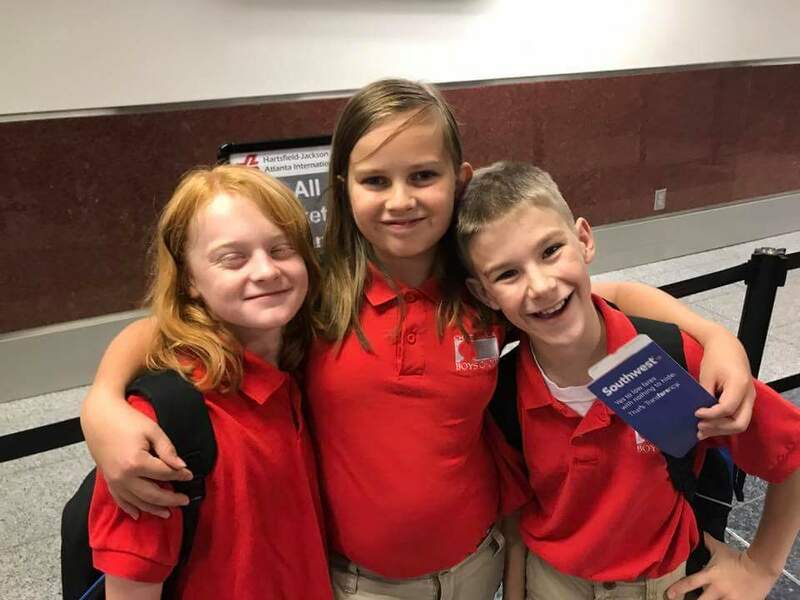 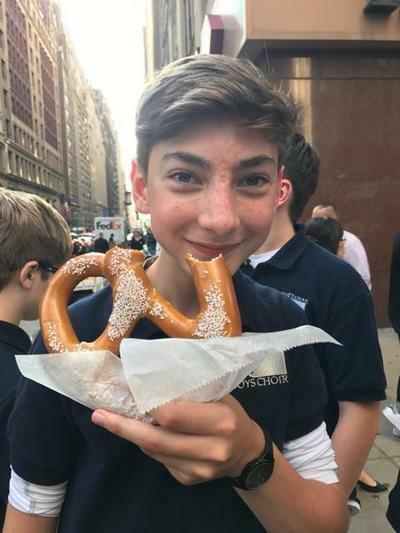 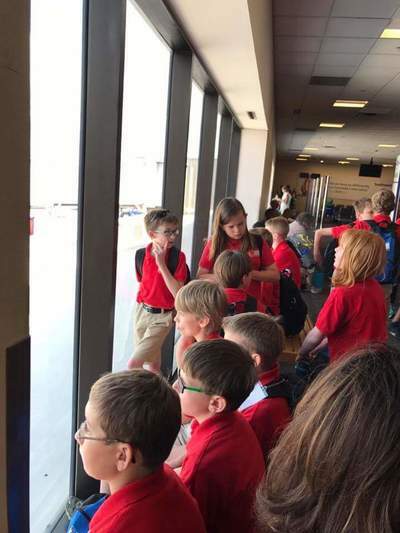 Every single chaperone recounted comments they received or overheard on the bus, in the airport, in restaurants, on the hotel, and on the plane about how kind, thoughtful, and gentlemanly our choristers are. 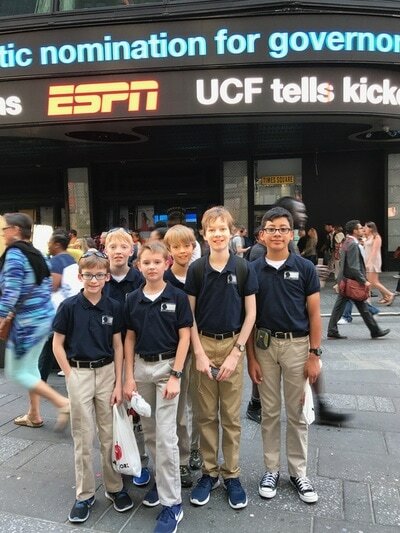 Parents of these young men, you should be so very proud of your sons. 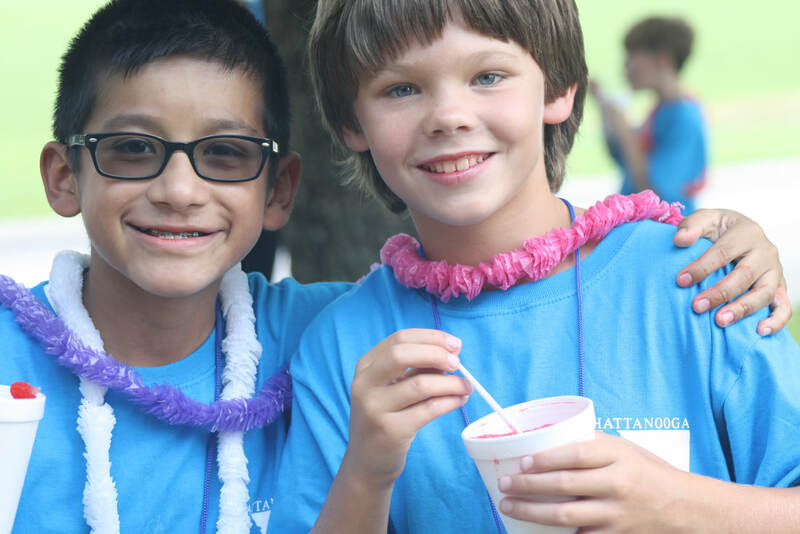 Alumni, you should be thrilled to know that your legacy is continuing. Chattanoogans, you should be proud of how these boys are representing your city. 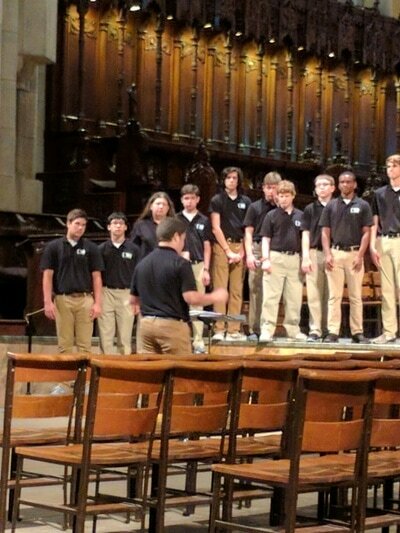 I sometimes forget just how spoiled I am by the incredible choristers of the Chattanooga Boys Choir. 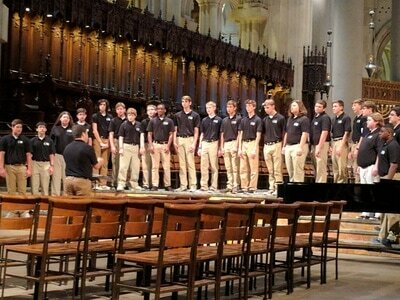 Following an INCREDIBLE collaborative performance with one of the most prestigious collegiate choirs in the country (Florida State University…yes, this Gator just said that!) 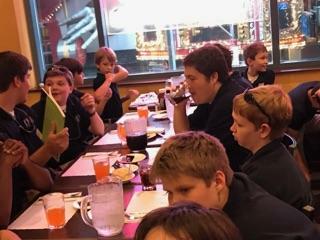 and a much-needed spring break, the boys returned to work this week as they set their sights on the repertoire that will serve to close the 2016-17 season. 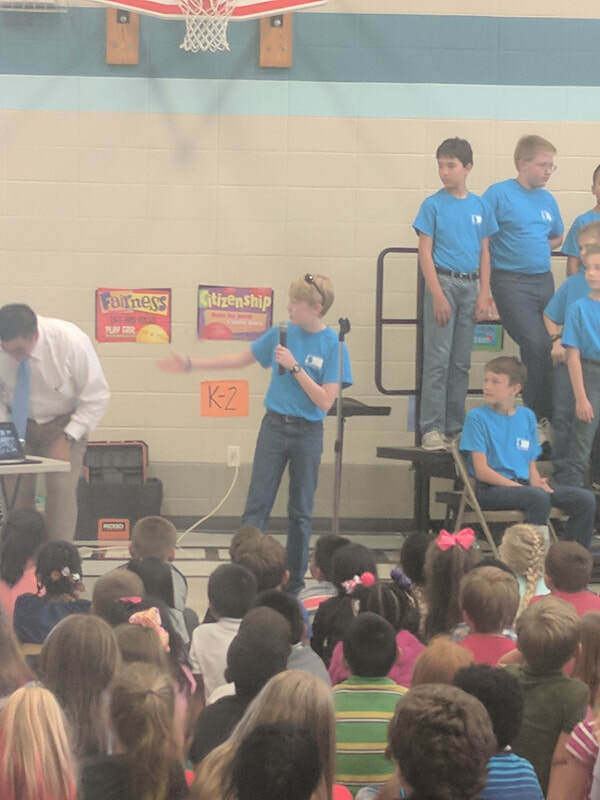 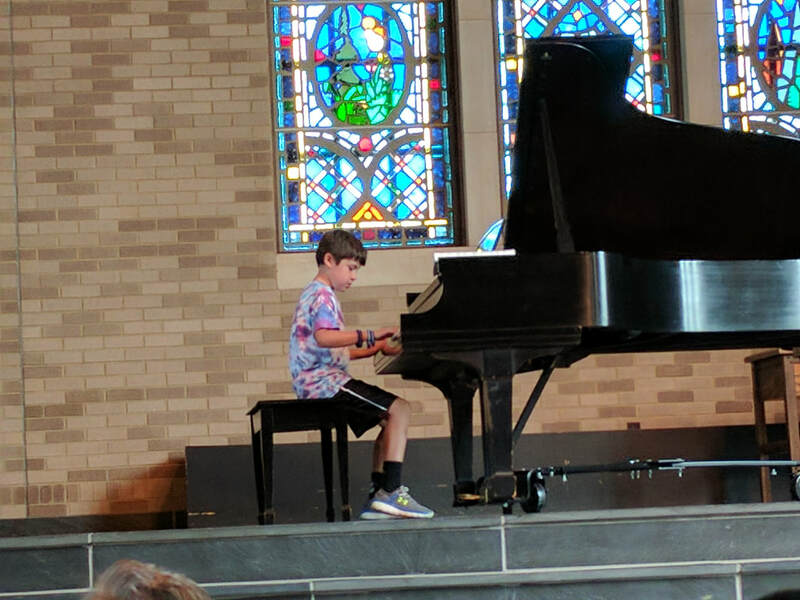 Despite egregiously high pollen levels and shaking off the “rust” from spring break, the boys absolutely floored me with their sight reading skills and musicianship. 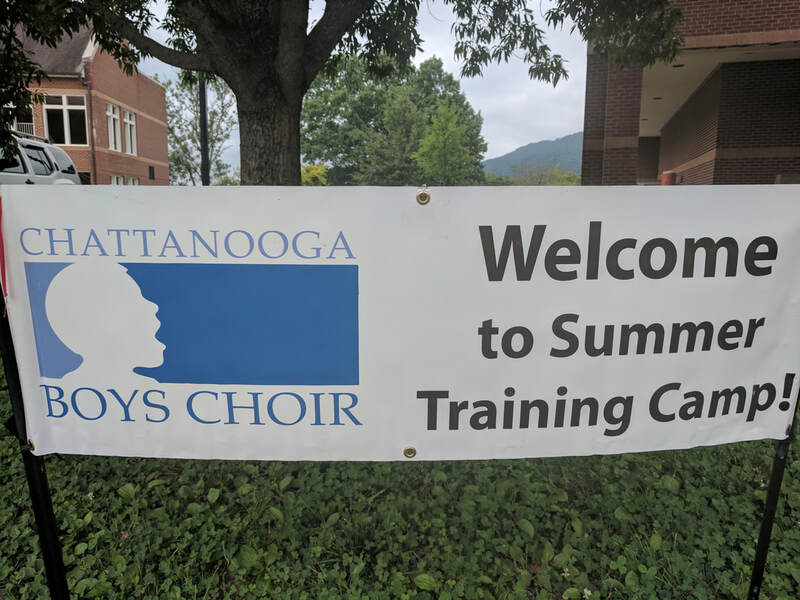 They began rehearsal by singing a stirring arrangement of The Star Spangled Banner, with which the CBC will open the Chattanooga Lookouts’ season next week at AT&T Field. 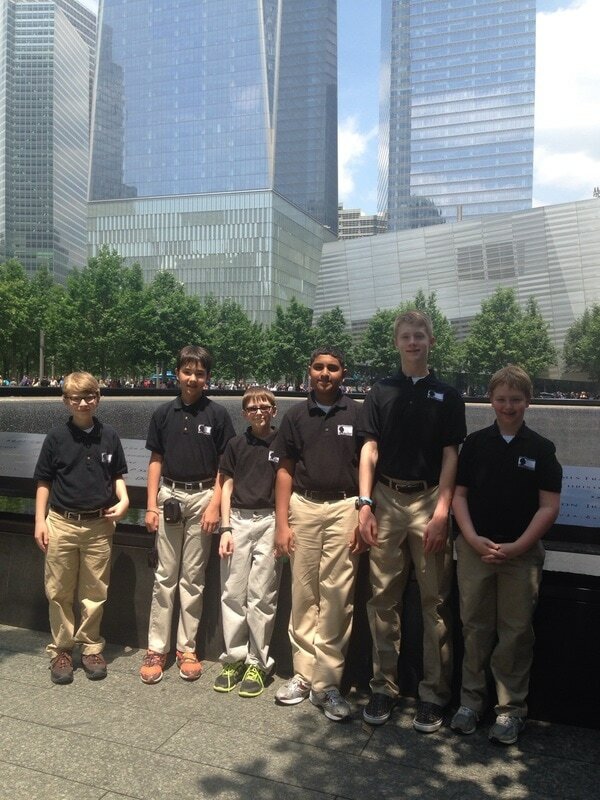 Listening to them sing our anthem instills a feeling of pride and optimism about our future. 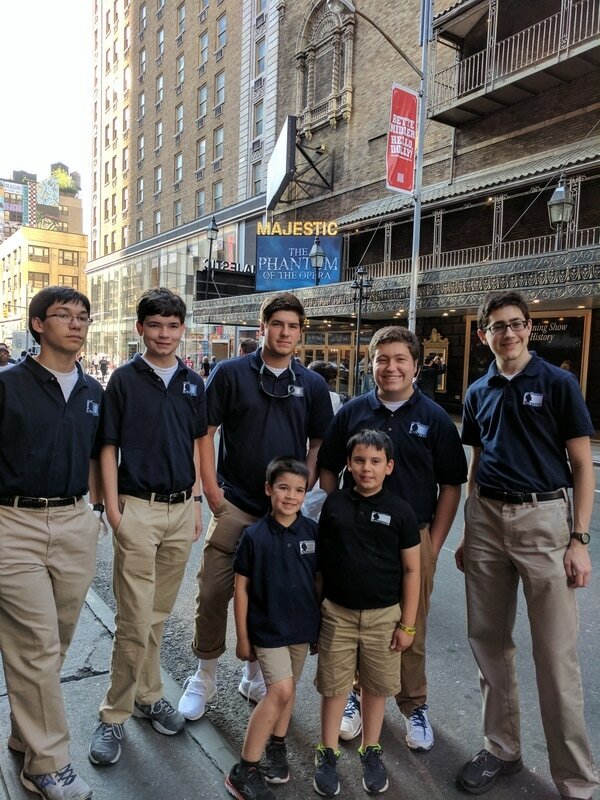 The boys then took their first look at Pablo Sosa’s arrangement of the Argentinian song ¡El Cielo Canta Alegria!, which is a rousing and exciting piece filled with all types of rhythmic and dynamic challenges. After just one sing-through of the piece, it was exhilarating to watch the boys high-fiving each other over their successful first attempt! 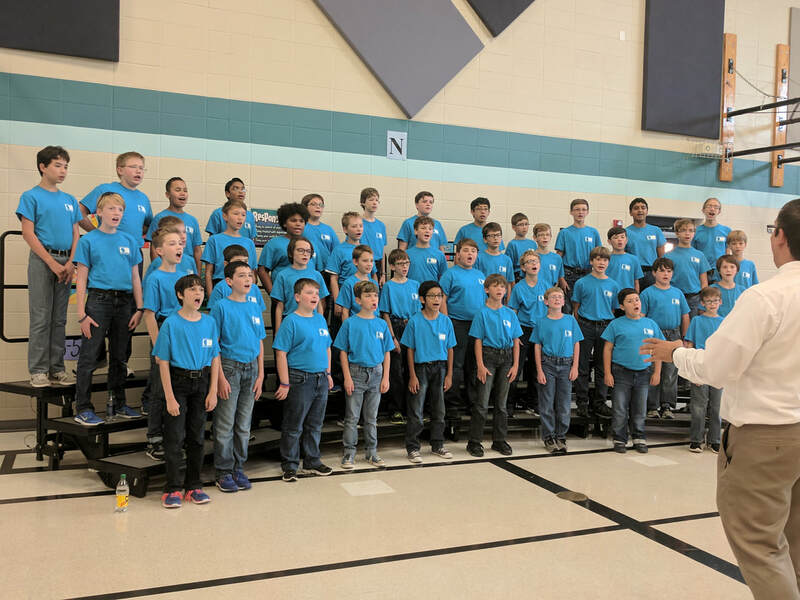 We then made our way to a marvelous original work entitled My Heart is Steadfast by the choir’s dear friend Ken Berg of the Birmingham Boys Choir. 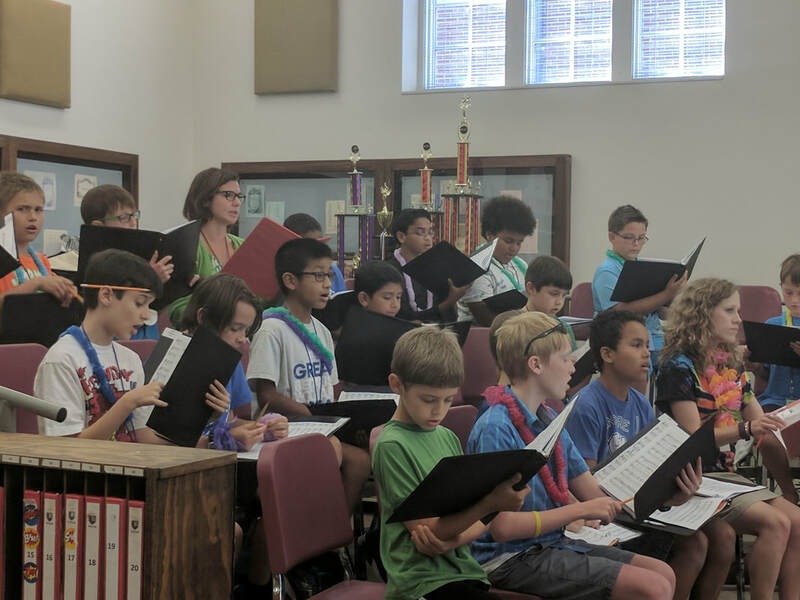 This piece is filled with the aforementioned hemiola figure, whereby the choir constantly shifts the six beats in a 6/8 measure into alternating groupings of two groups of three and three groups of two (think of the opening of “I Want to Live in America” from West Side Story). This is a tricky concept, as it can be difficult for some singers to settle into a comfortable pace of executing this pattern, while others might have difficulty delivering each beat correctly while effectively delivering the alternating emphases. 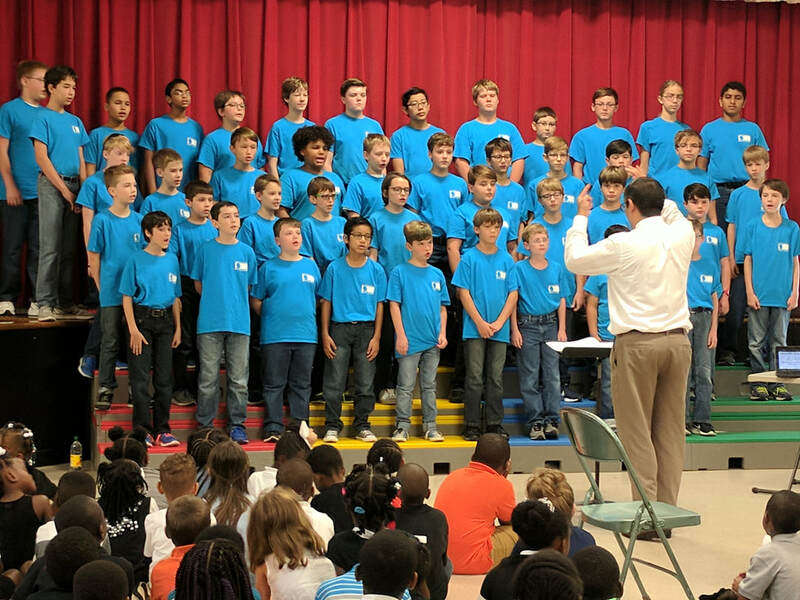 It requires a complicated mix of math, language skills, musicality, and teamwork to do this well and - wouldn’t you know it! 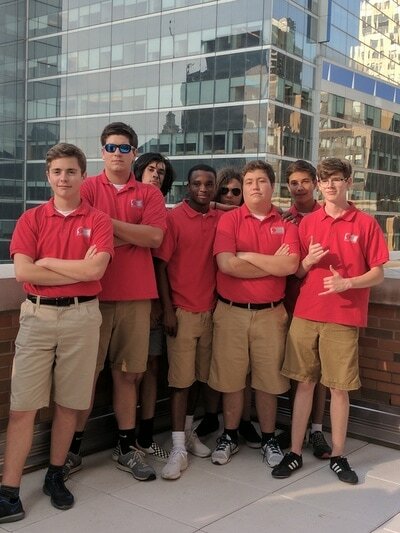 – our boys delivered. 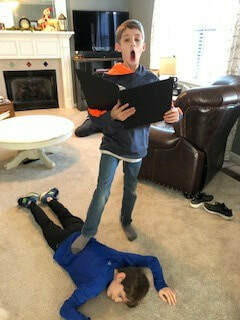 I should not have been so surprised, but I was somewhat surprised with just how well they did this and how seemingly easy it was for them to do so. I was so proud of our boys through this rehearsal process, and I could not have been more pleased with their initial efforts…I already know that you will be delighted with this and more at their Finale! 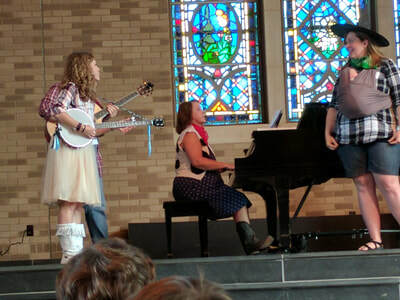 concert in May. 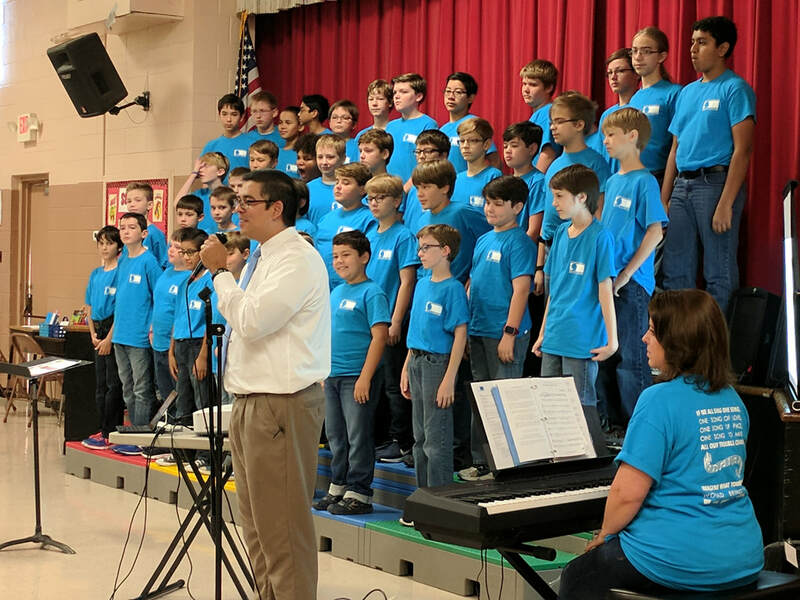 While I know the concept of performance is the public and outward representation of the hard work and talents of our boys, it is not lost on me just how impressive our daily achievement, our weekly process, and our constant improvement is. 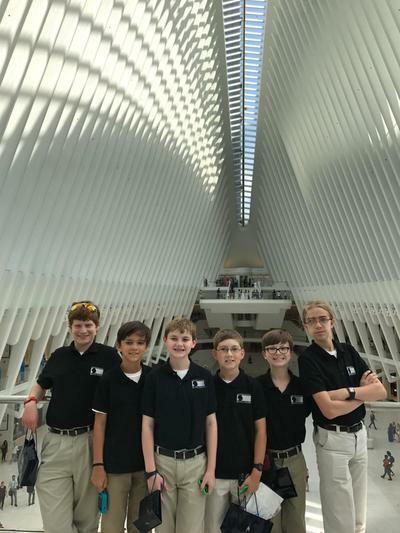 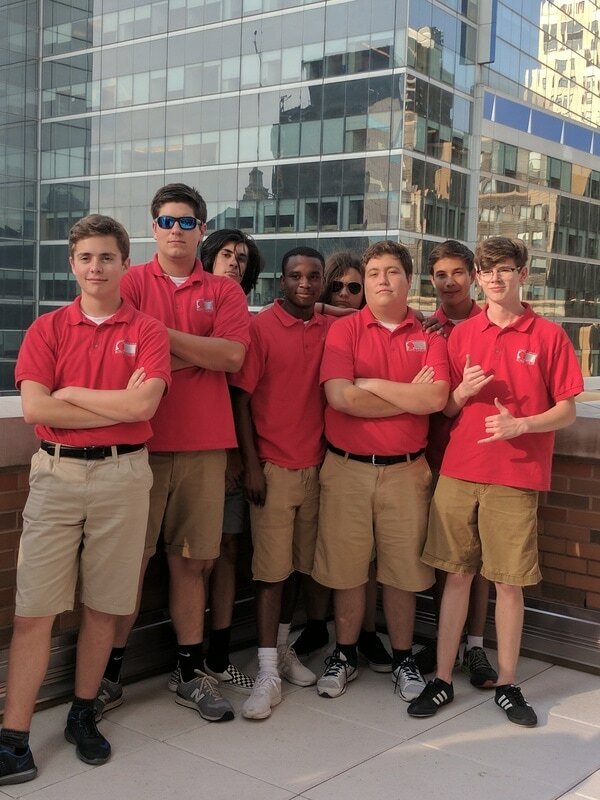 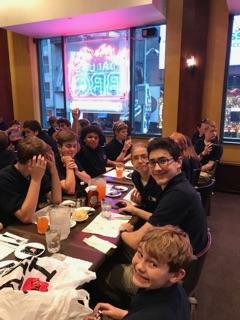 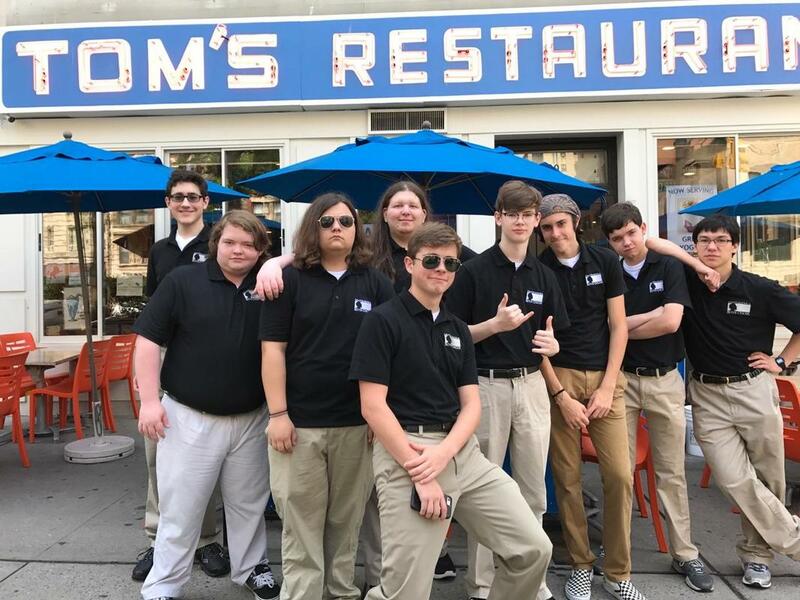 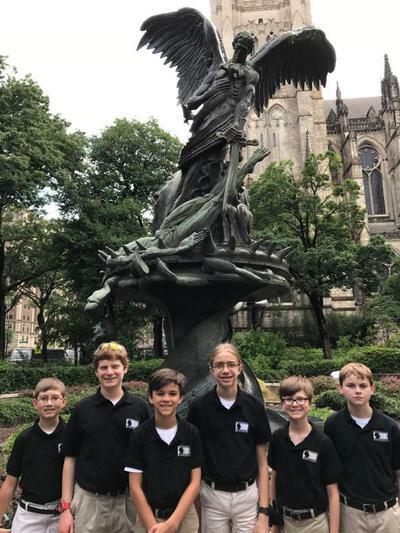 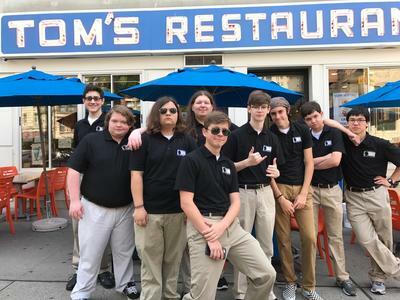 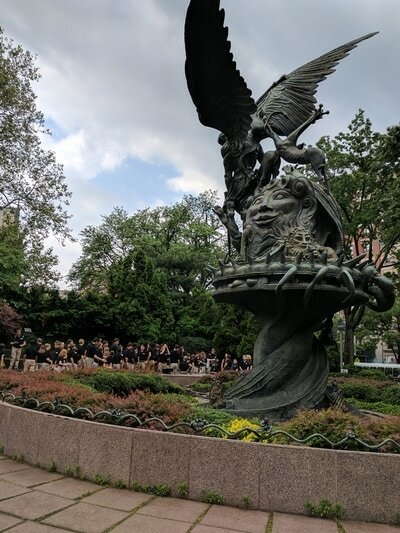 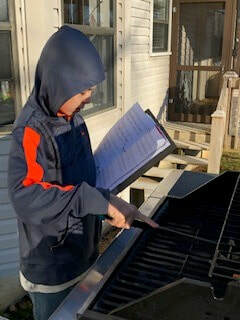 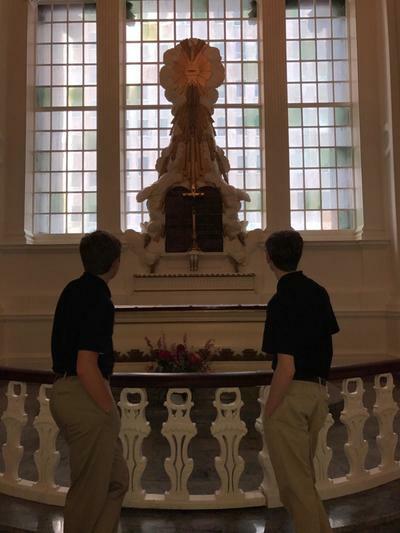 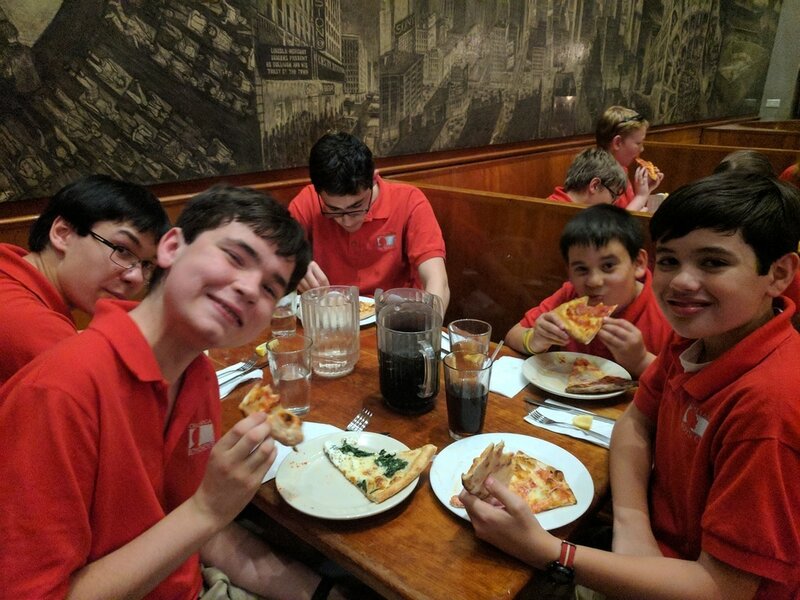 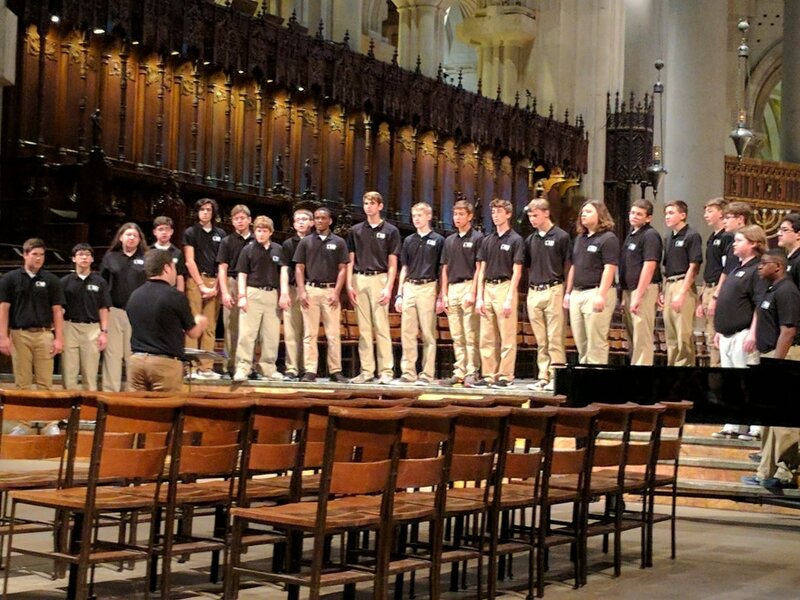 As a choir festival adjudicator recently told me, “Choral excellence is an amalgam of incredible individual efforts.” These boys bring their intelligence, their artistry, and their hard work into rehearsal each day, and I benefit greatly from their efforts, the amazing and dedicated work of our staff, and the support of our choir families. 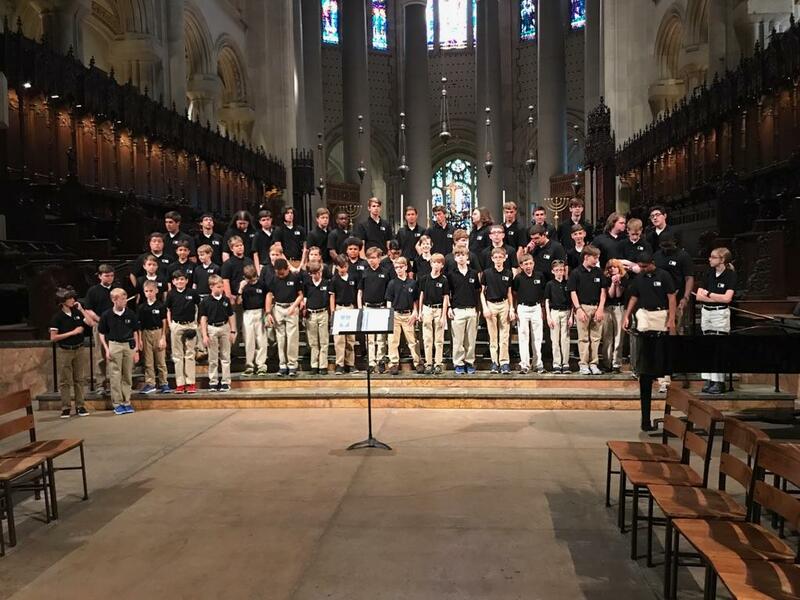 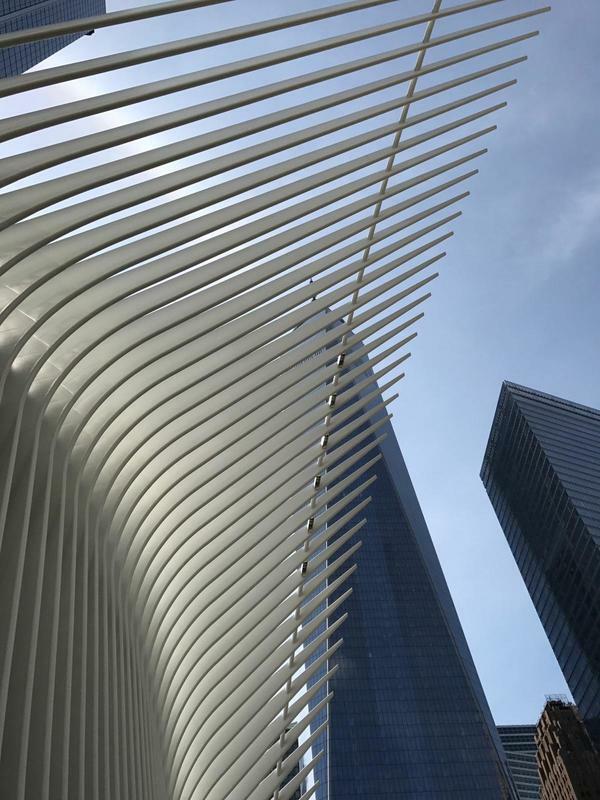 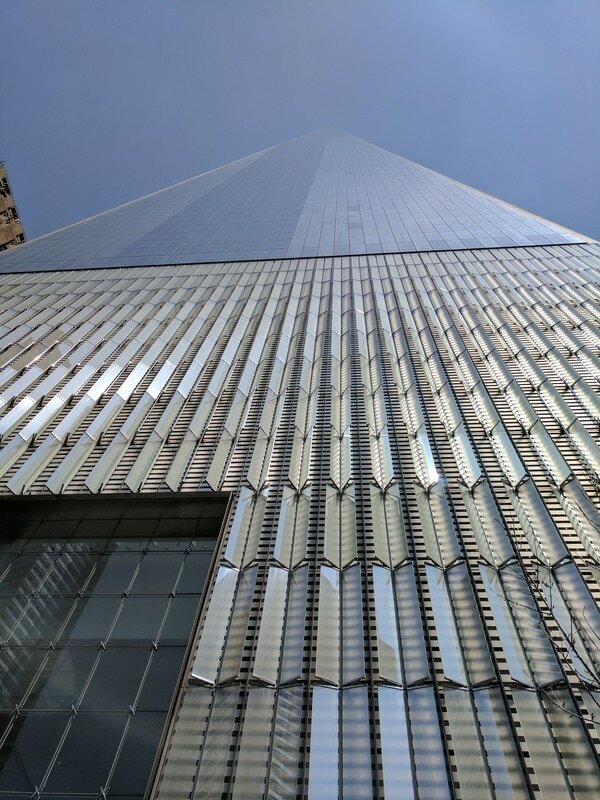 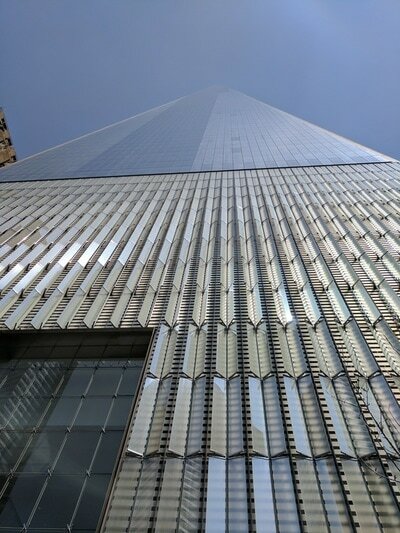 It is quite the sight – and sound! 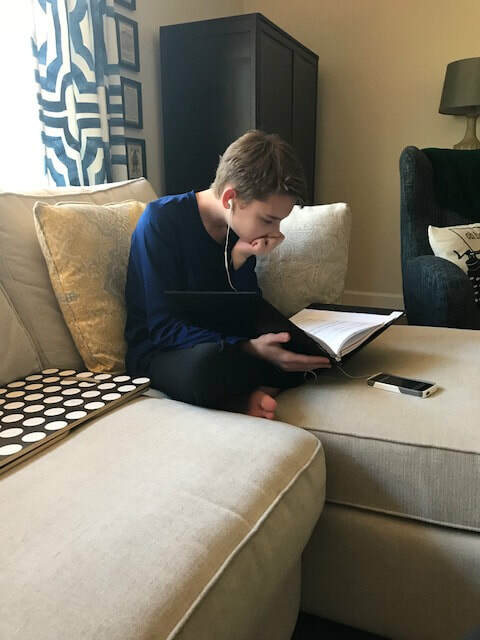 – to behold, and I never take it for granted.